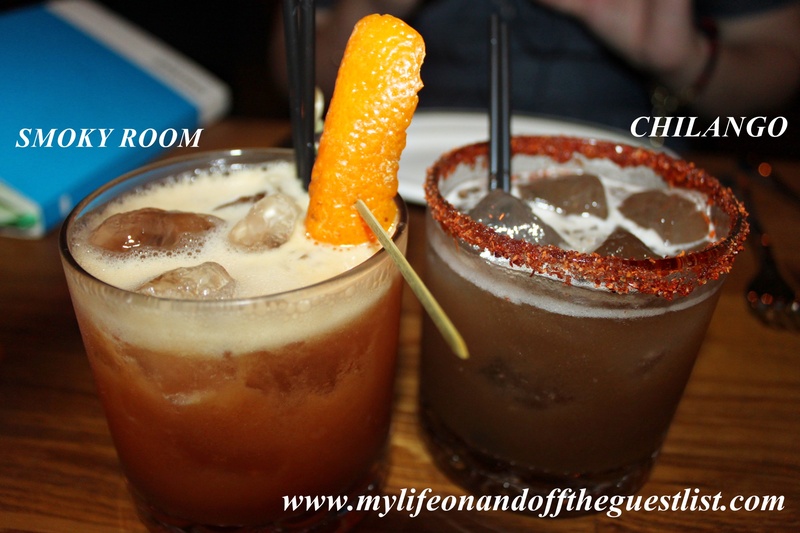 The restaurant girls are back once again to bring you our tales of foodie adventures. 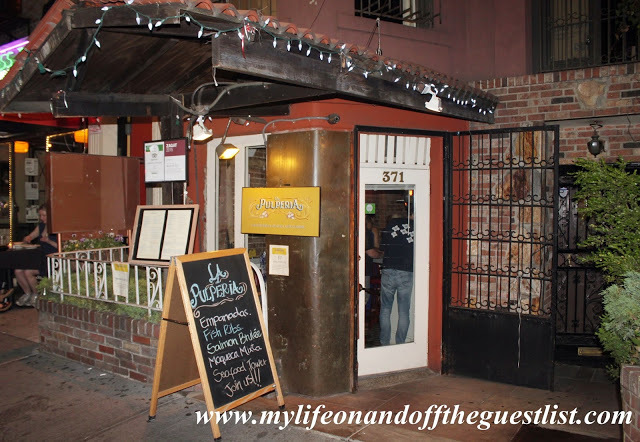 in this restaurant review, Christine Ongsueng, and I are traveled all the way to Astoria, Queens (okay the trip out there wasn’t that bad), to bring you our review of Ornella Trattoria Italiana, a fine dining regional Italian restaurant which offers innovative dishes, organic ingredients, recipes passed down from generations, and pasta dishes which boasts pasta made fresh on site. Our host for the evening was none other than Ornella Trattoria Italiana‘s owner Giuseppe Viterale, a man who truly loves and appreciates food, and loves sharing stories about the history of food, tips and tricks, and his favorite dish (Pasta Fagioli), and of course, regaling his customers on what they’re eating. 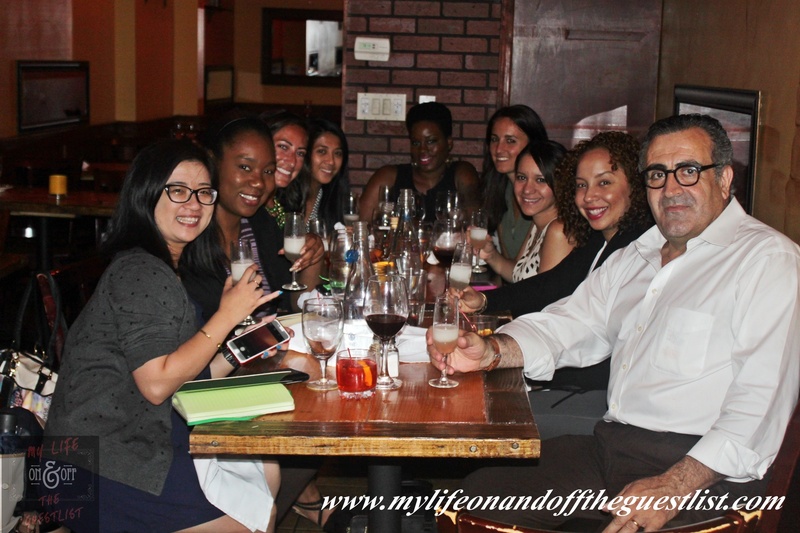 We learned more about Italian cooking in one evening than I’ve ever known in my entire life. Chris: What a wake-up call to the taste buds! This aperitif was too spirited for me but then again I’m a lightweight who is also not into spiced grapefruit drinks though one swig was all it took to shake my bleary eyes open and ready my appetite. 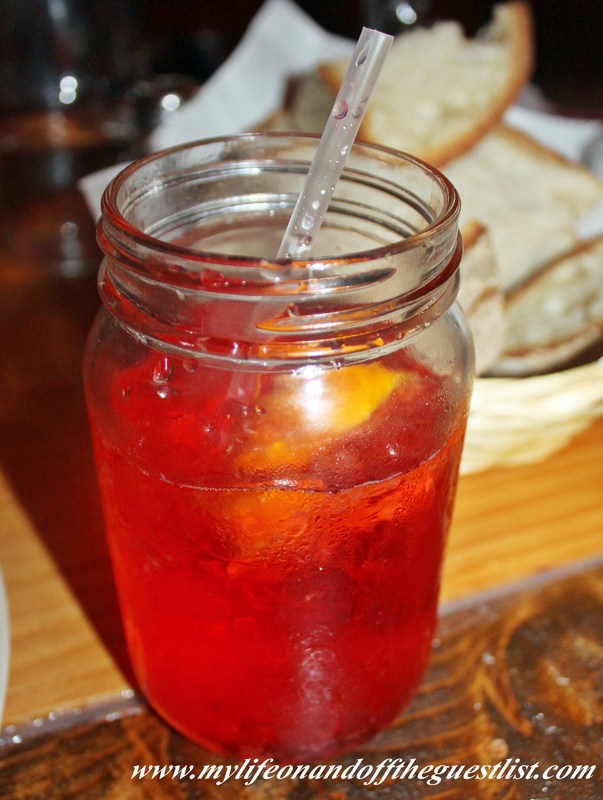 Glasgow: This traditional Italian cocktail featured three things I am not a fan of: Campari. I’m not a fan of bitter cocktails but as Chris stated, it certainly woke up my taste buds and did pep me up. Funny enough I grew up in a house where Campari was the norm, my family would absolutely berate me for not finishing this aperitif. Chris: The perfect starter: soft and creamy burrata, prosciutto, and peach slices with some balsamic reduction sauce. 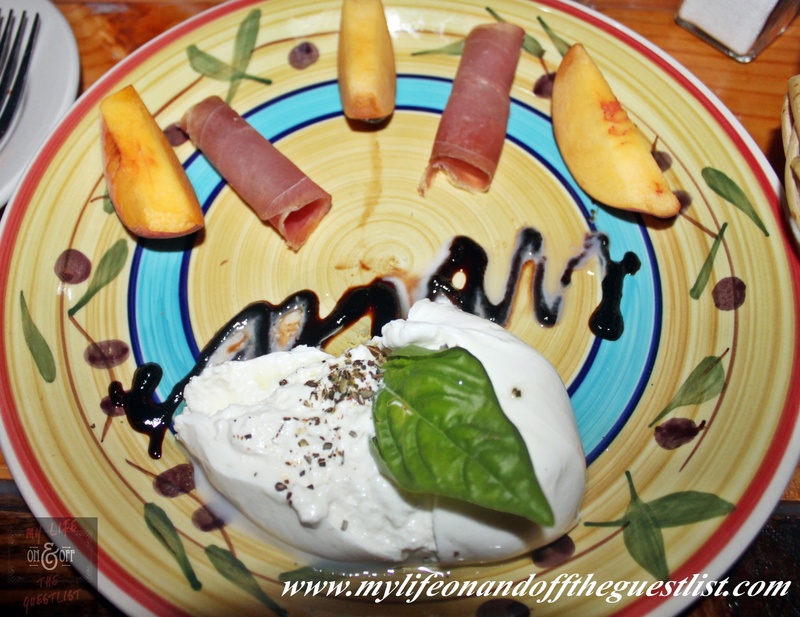 I would have been happy with just the prosciutto and the burrata, but the peach slices were a refreshing bonus! 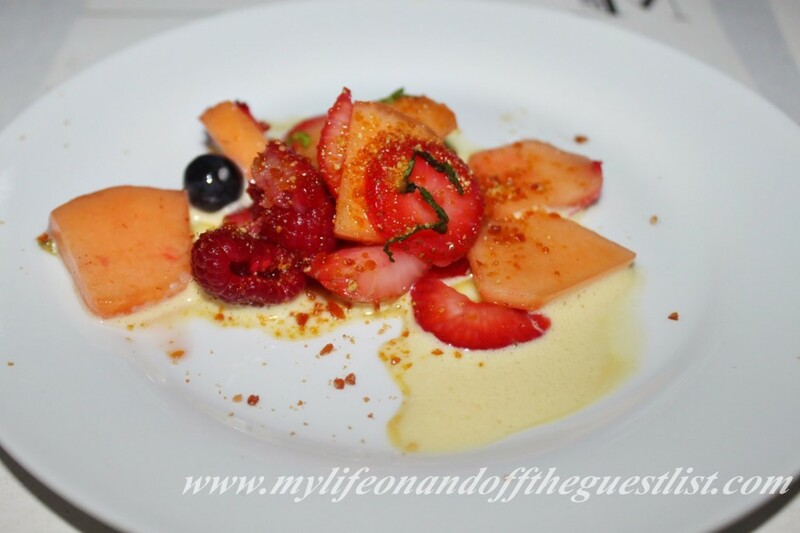 The balsamic reduction was also noteworthy because it added to the complementing lightness of the peach. Glasgow: I’ve always loved the combination of savory and sweet, especially when the sweet part is light. Giuseppe sometimes likes to go off-menu, something I end up enjoying all evening. This dish traditionally is “fresh mozzarella filled with creamy ricotta ovearugolla with tomato & spiced walnuts”, but as you can see he paired it with peach slices and prosciutto turning it into a perfect seasonal starter. 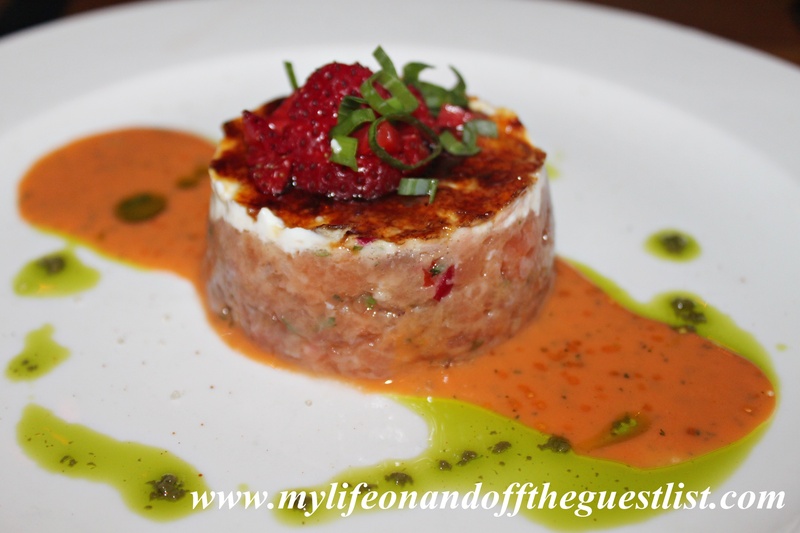 Glasgow: I consider this part of the first course only because they were brought out around the same time but this simple, different take on bruschetta was a welcomed starter. 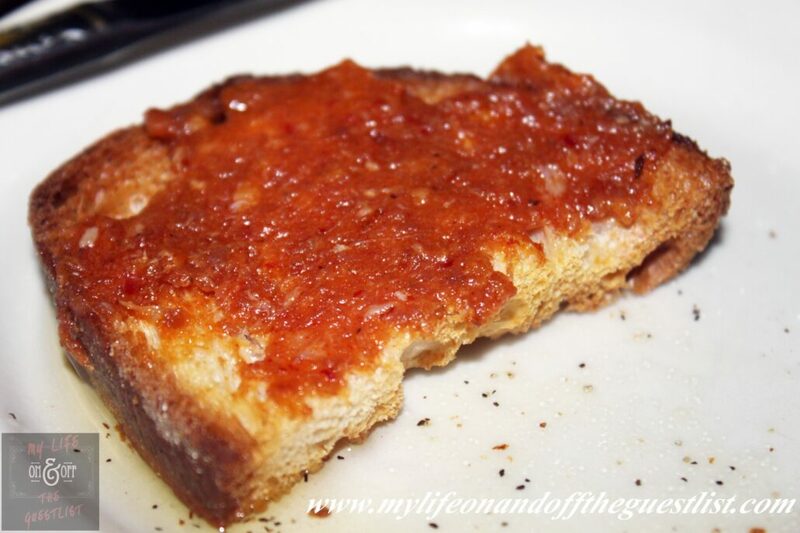 I’m usually fighting to keep the tomato on the bread whenever I take a bite on traditional bruschetta, it was nice not to have to do so, and the incorporation of spicy sausage (don’t worry its not too spicy), is a delicious addition. Chris: With the overwhelming heat and humidity of summer, one does not always want to eat heavy meals. The summer pasta was the unexpectedly perfect dish for this sweltering season. I know what you’re thinking– pasta is a heavy food, but when you have the right proportion of savory and fruity, then it becomes a delectable summer dish. 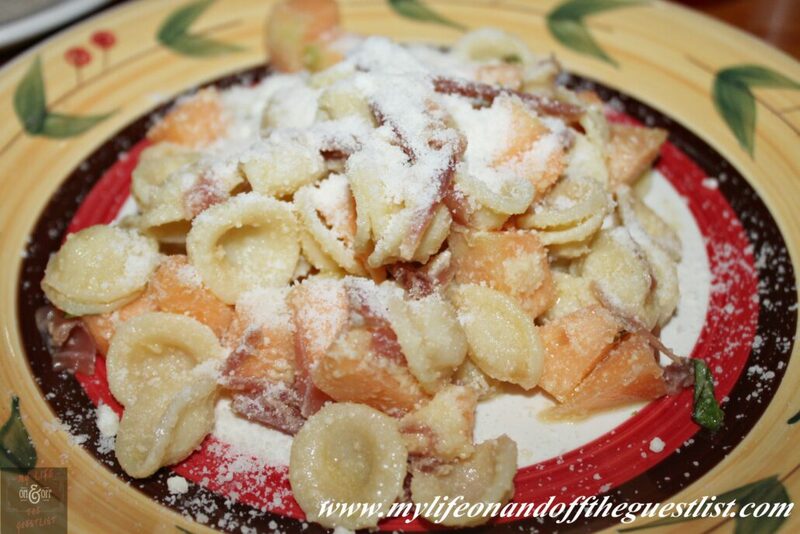 And yes, that was just another curveball thrown at you– fruit in pasta– a cantaloupe to be exact. Trust me– it sounds weird, but it works. 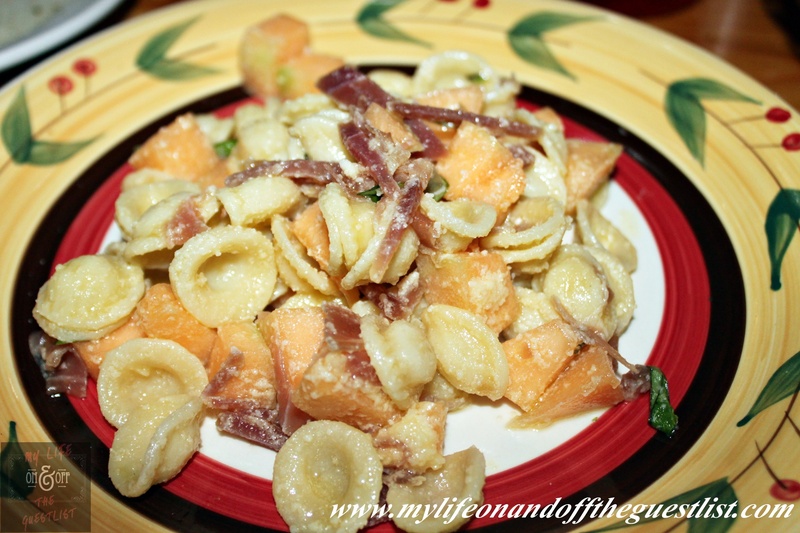 Pasta in the shape of shells, mixed with prosciutto, and cantaloupe topped off with grated cheese makes for a light balance of sweet, salty, and juicy. 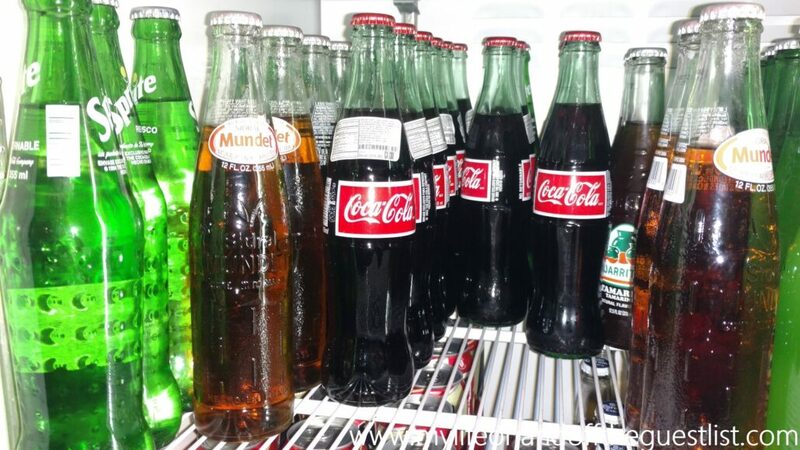 The seemingly opposing flavors just melds together in a symphony of tastes. Glasgow: Another wonderful trip off-menu, Giuseppe took the wonderful, vegetarian Orecchiette con RABE dish and “summer-ized” it. Switching out the broccoli rabe and sundried tomato for prosciutto and lightly sweet and crisp cantaloupe, not only has he lightened up the pasta dish to levels even dieters can rejoice, he’s added a new flavor element and created a perfect, light, summer dish that I’d personally enthusiastically eat for lunch and dinner every day. 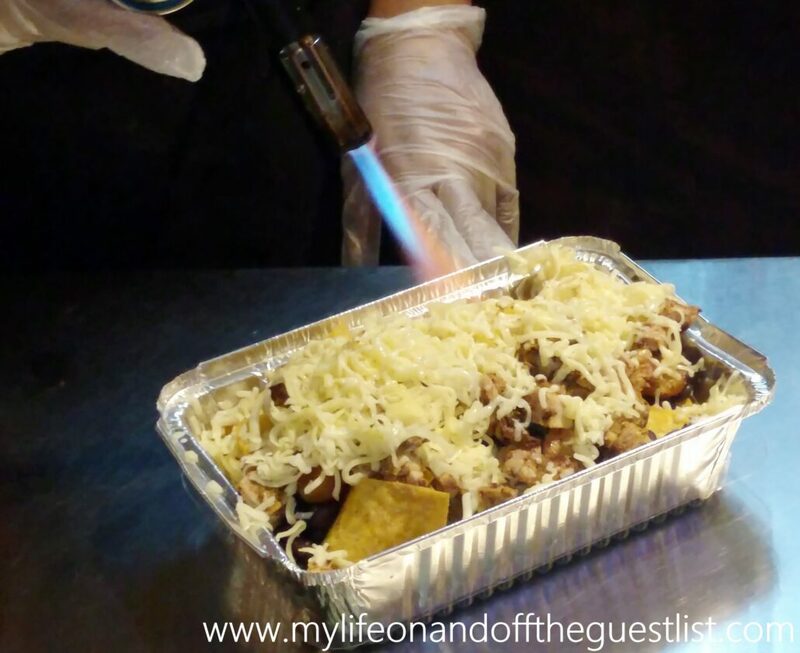 Deliciousness abounds with and without grated cheese. Chris: Yes as in the ones roasting in an open fire. This is definitely something very different. 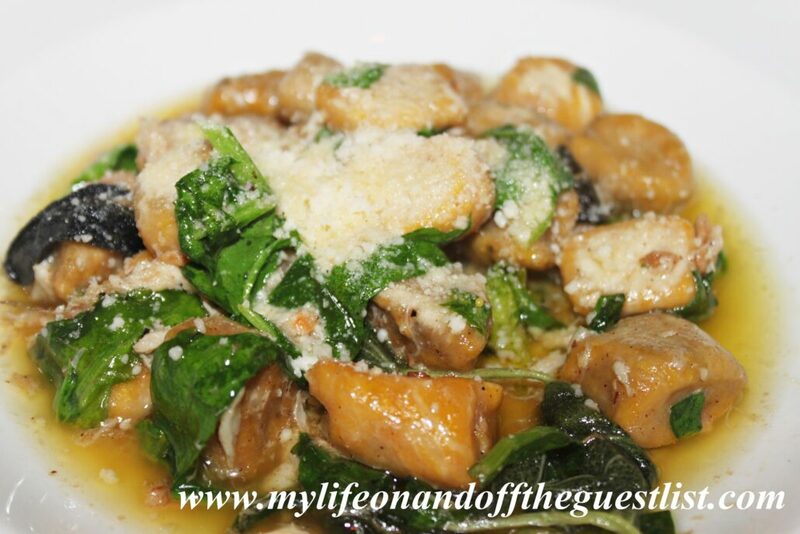 I happen to love Chestnuts and turning it into the flour for the pasta is nothing short of genius. 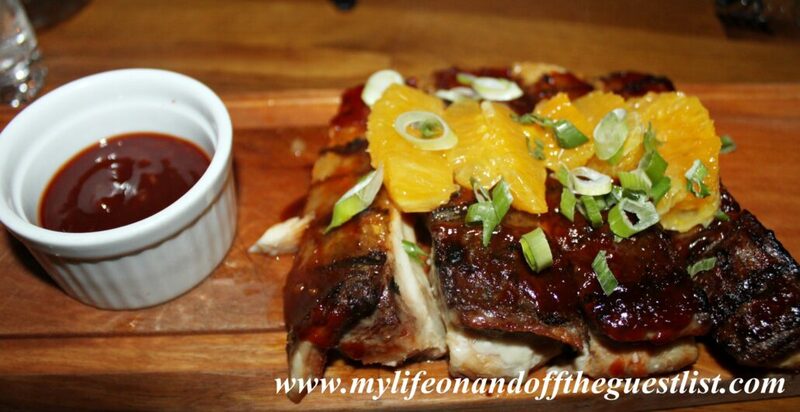 Sweet and earthy, this is a unique dish to be experienced. You’ll be surprised at first because a heavy nutty essence is not something you associate with for a pasta dish but after a couple of more mouthfuls, your mouth will delight in its fascinatingly complex taste. Glasgow: Have you ever eaten something so delicious, that your body reacts so very pleasurably, with involuntary actions like eye twitching? That is what happened to me when I had my first forkful of this incredibly rich, decadent pasta. If you’re a fan of pasta with a creamy, slightly sweet distinctive taste, this gluten-free, grayish pasta made from ground chestnuts is for you. 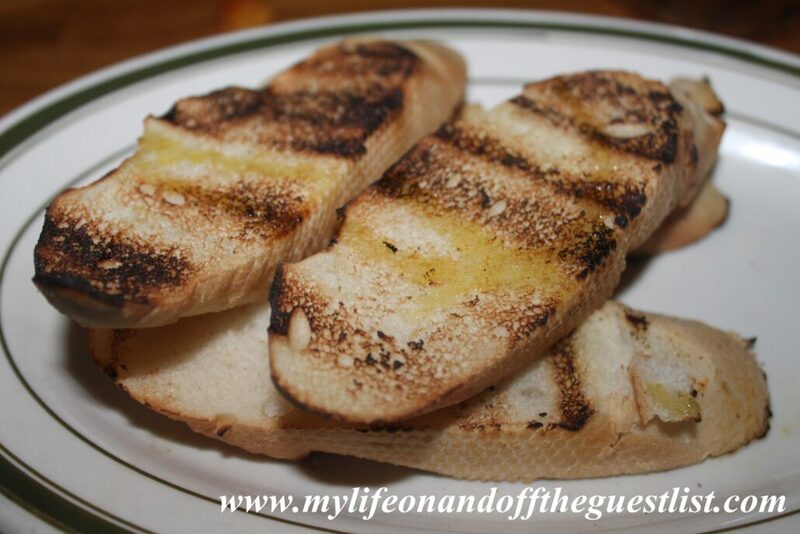 For those of you with celiac disease or other gluten intolerances and allergies, run, don’t walk to Ornella Trattoria and order a plate for yourself. You will dream about the creamy pistachio sauce peppered with truffle oil, and may find yourself asking your table-mate if they’re going to finish theirs….they will…you might as well order an extra. Chris: Pasta wise, I did not think anything could top off the Chestnut, but after this was placed before me and I got a taste of it, I had a new favorite. While this does not stray too far from what one thinks pastas could be made out of, it is still a different take on pasta making tradition.The buckwheat flour turned into wide flavorful ribbons mixed in with garlic, olive oil, and roasted potatoes is the perfect combination of hearty, healthy, and heavenly. Glasgow: an incredibly delicious pasta, no doubt, but my taste buds were already under the spell of the Chestnut Pasta. This makes another great option for those that are on a gluten-free diet since the flour is made out of ground whole grain buckwheat. The dish is a medley of flavors and textures thanks to its potatoes, cabbage, and Fontina cheese. 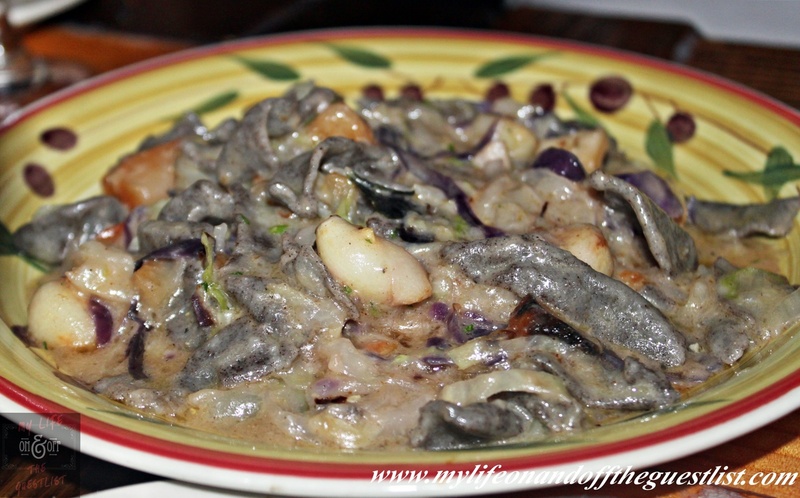 I believe if I hadn’t tried the Pasta di Castagna, this would’ve surely been my favorite pasta dish. Chris: Yet another creative concoction that sounds unusually opposing at first but actually works. 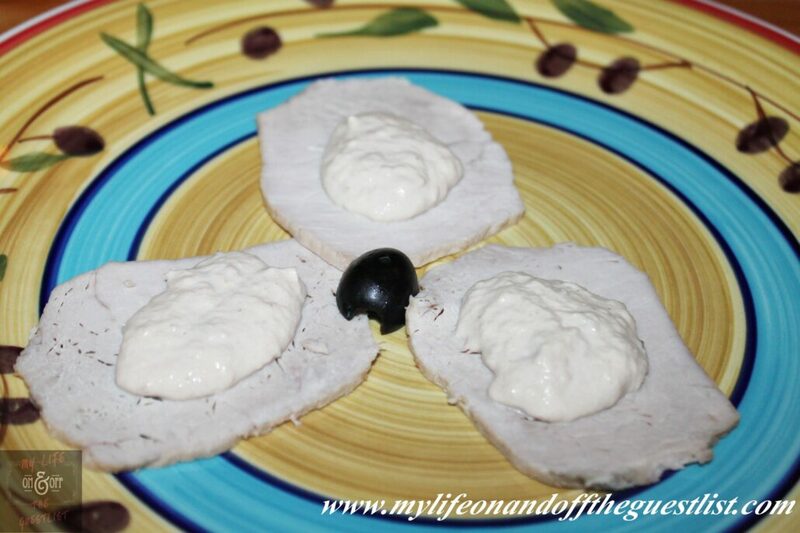 Thin slices of lean pork tenderloins served as a base for tuna topped with olives. 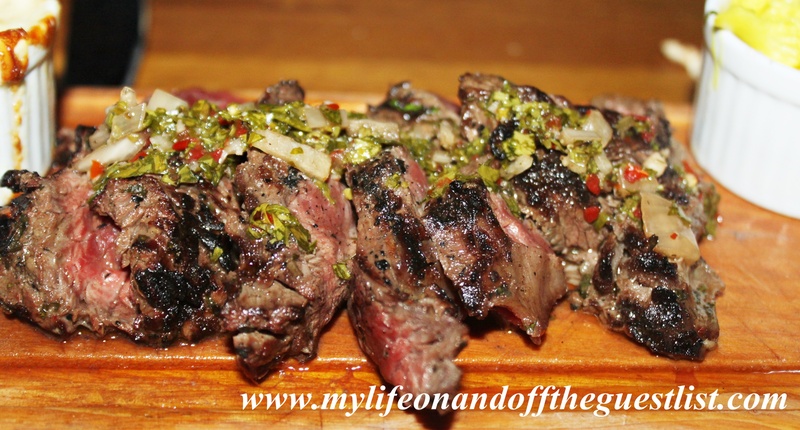 The “other white meat,” i.e. the pork, provided for a more solid structure and balance for the soft tuna. Glasgow: This was an interesting break in the meal and something not on the menu. You may think it strange at first to have these two proteins together, but it actually worked. 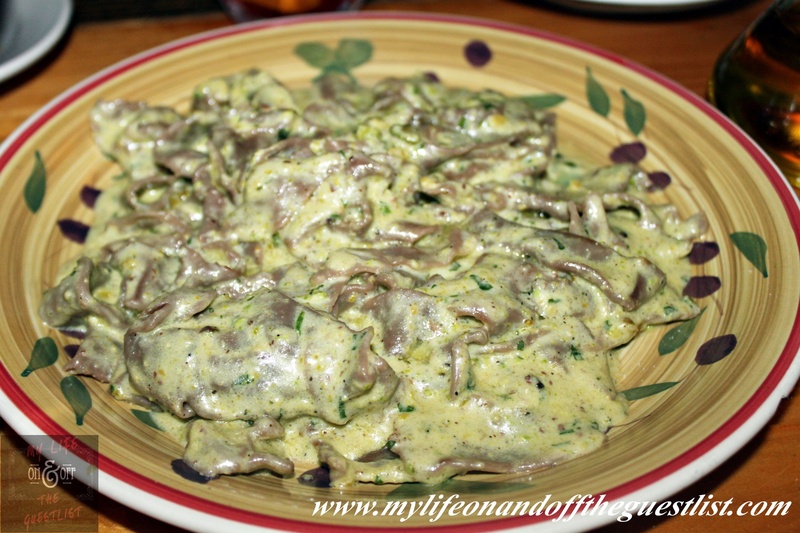 I believe this dish to be a spin on vitello tonnato, which is veal with tuna sauce. 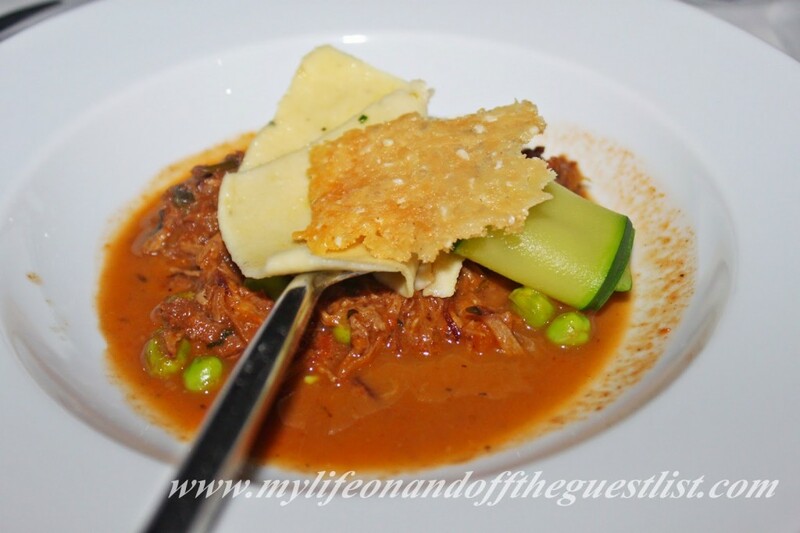 The tuna, (served as a thick sauce on top of cold, thin-sliced pork) of course dominated the palate but I found it refreshing as a summer dish. 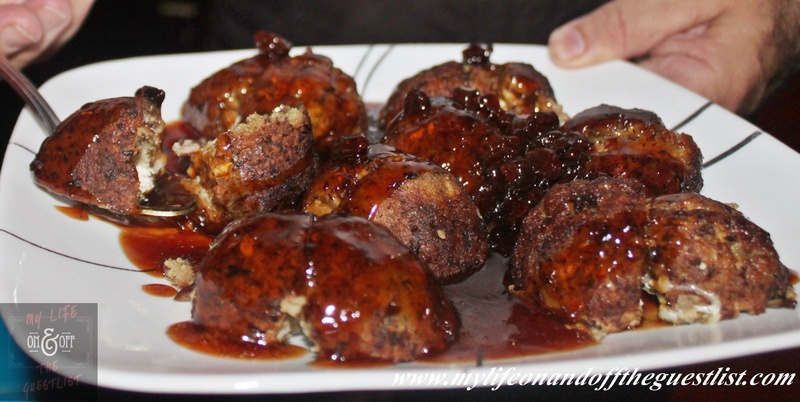 Chris: I’m usually skeptical when I hear people are really into something, because it is usually a silly fashion trend or a hybrid of breakfast pastries, but the exception is duck meatballs. Everyone and anyone who has ever tasted them will start proselytizing about this amazing amazing AMAZING creation. I am a big fan of duck to begin with, and have had them in many different ways, but I have never tasted them quite like this. 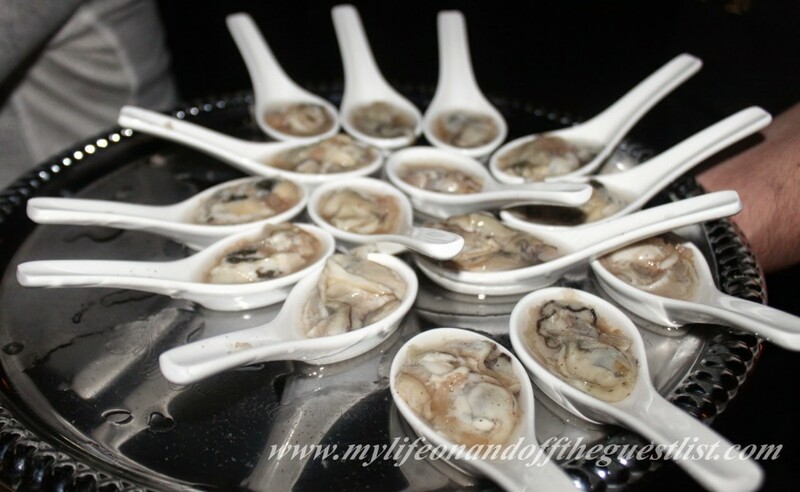 There are no words to explain the sheer orgasmic joy of biting into one of these orbs of culinary perfection (no, really it was an out of body experience as witnessed by fellow blogger Lucky Seven Ten. Made with a blend of mozarella, fontina, ricotta, and raisins plunged into a brandy based sauce, I was easily converted and will be singing its praises for as long as I live. Glasgow: This was the dish I was really looking forward to trying. Ornella is famous for their Duck Meatballs and after one bite, you will see…eh…taste why. When you’re ordering that extra plate of Chestnut Pasta to go, make sure you do the same with the Duck Meatballs. I’m not at all ashamed to say, I heartily ate and took home, these sweet mounds of juicy duck, filled with various cheeses, and immersed in a divine raisins and brandy-based sauce. DAMN it’s delicious. It may ruin you for other dishes. I think I floated on air and my eyes, along with several others) rolled into the back of our heads in this trip to foodie heaven. This is a dish that would convert a vegetarian, that’s how delicious it is. Chris: Now this is how every meal should end. Traditionally made with limoncello and sorbet, Giuseppe yet again improved on something already in existence when he noticed that the sorbet and the vodka tended to separate like oil and water. So instead of sorbet, he used lemon Italian ice. He then mixed in vodka and a splash of white wine for a light and refreshing end to a parade of deliciousness. Glasgow: After so many courses, naturally we had no room for dessert, so Giuseppe offered this perfect palate cleanser and finisher for the hot summer night. 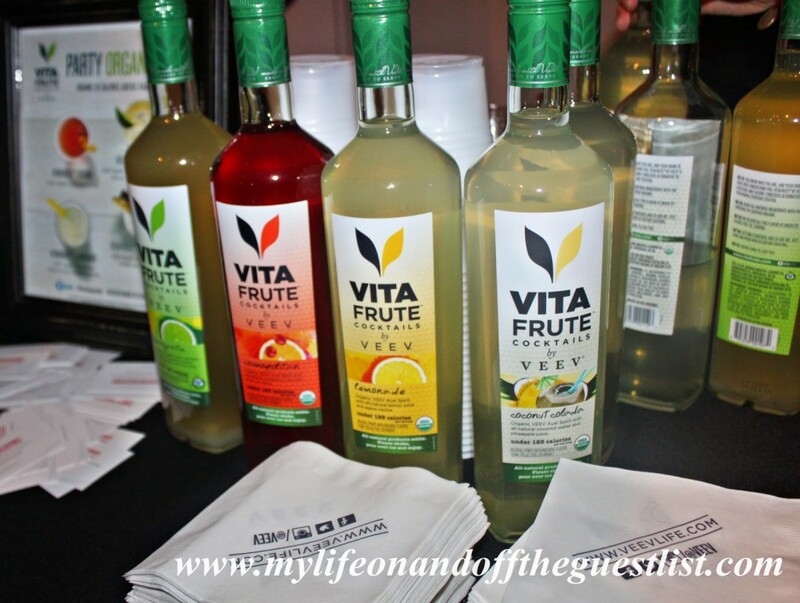 To say this drink was delicious and refreshing is an understatement. 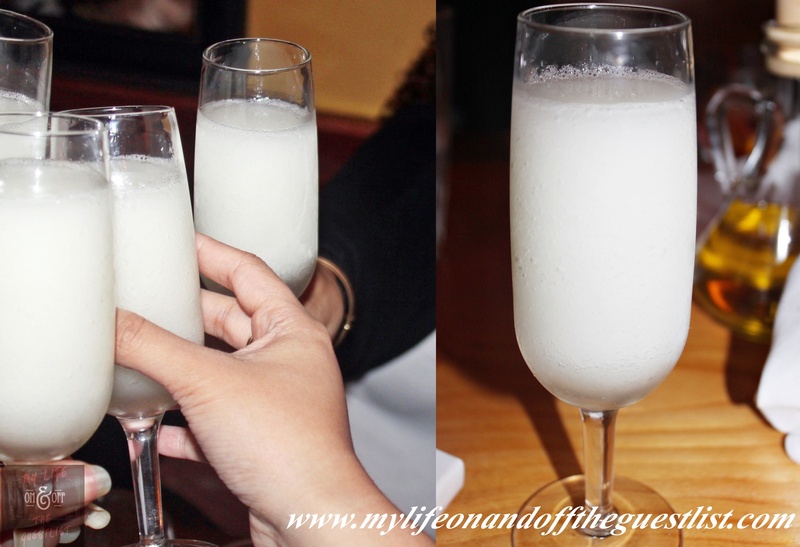 Very much a sophisticated slushy, the combination of Italian Lemon Ice (Lemon Granita), vodka, and white wine, seems tailor-made for the season. 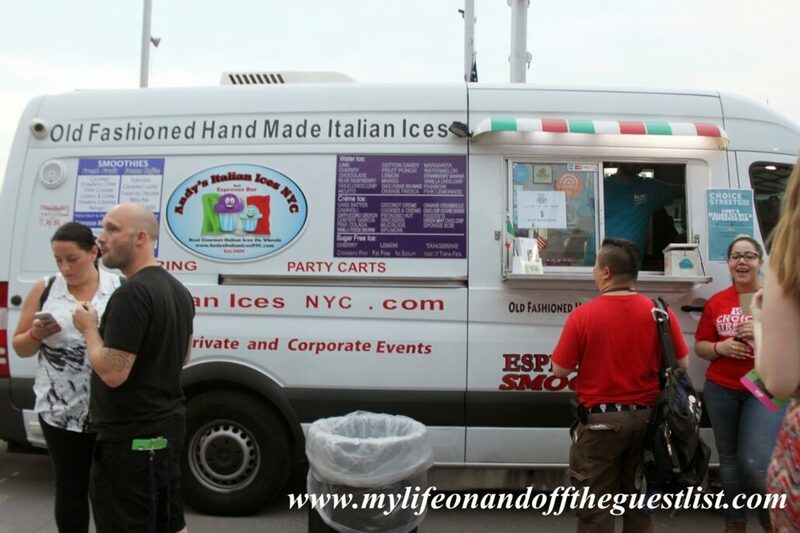 Chris: So let’s get this out of the way– yes, it’s in Queens (completely coming from a staunch Manhattanite). 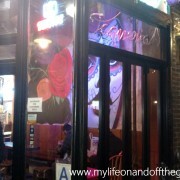 But it’s completely worth the trip and it’s only Astoria. 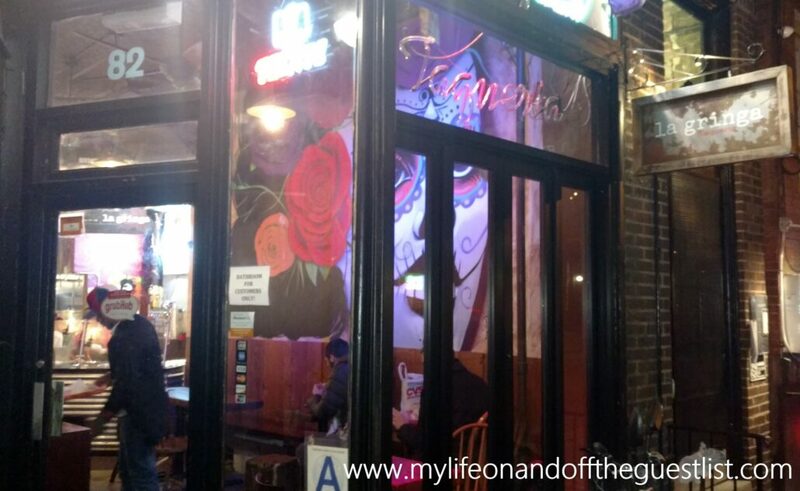 Astoria’s been one of those up and coming neighborhoods for a while now so there’s been an expected outcropping of popular eateries. But the unassuming facade of Ornella makes you almost walk right past it and makes it all the more exciting. 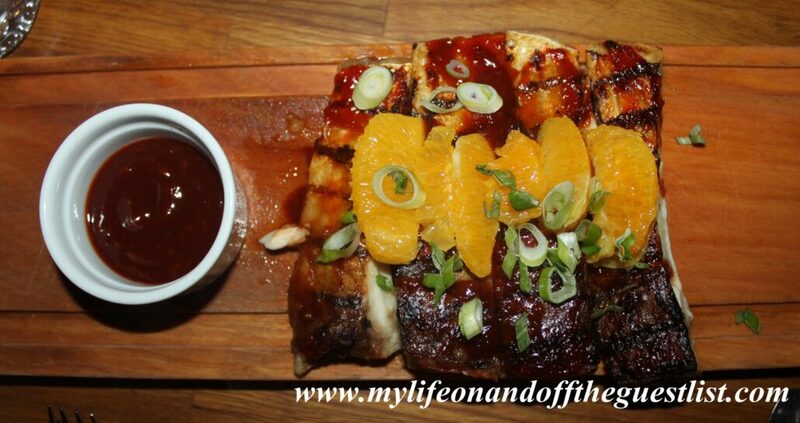 Like most of the things we love about the restaurants we review, it’s a hidden gem. I love that it no longer conforms to the restaurant trope of having an overpowering awning or fancy lettering– just a hand painted sign that is both mysterious and inviting. What lies inside is the soul of a home. 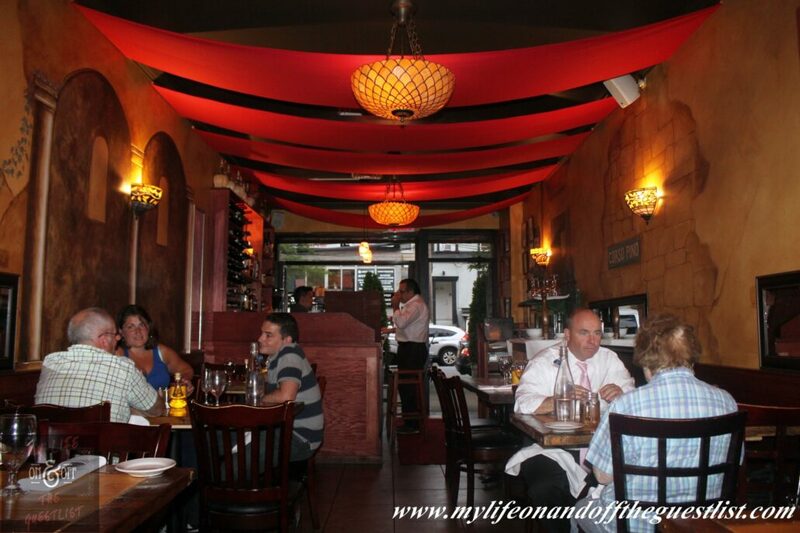 The trattoria is long and quaint with soft lighting and red drapes hanging from the ceiling, made to make you feel like you’re dining al fresco in the middle of a remote Italian village. 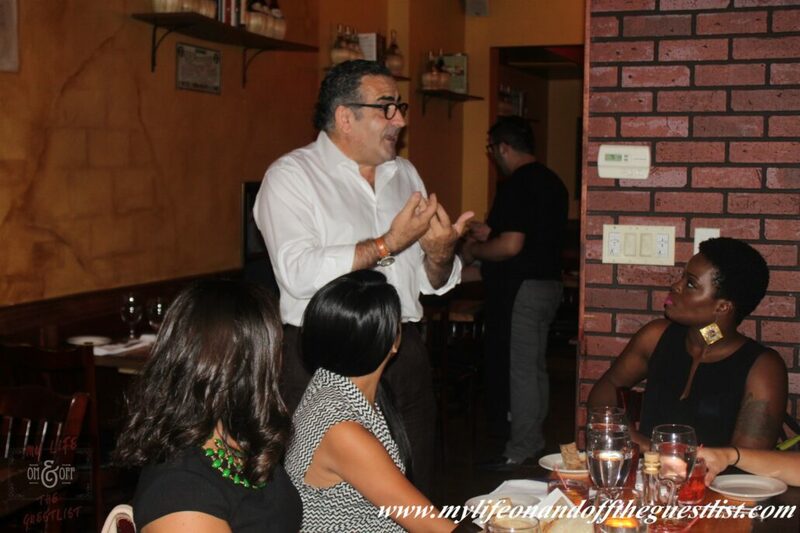 The owner and culinary mastermind, Giuseppe Viterale, welcomed us, along with a few other foodies, warmly and treated us like we were family. We were not only given delicious plates of food to consume, but we were also fed bits of history and philosophy. 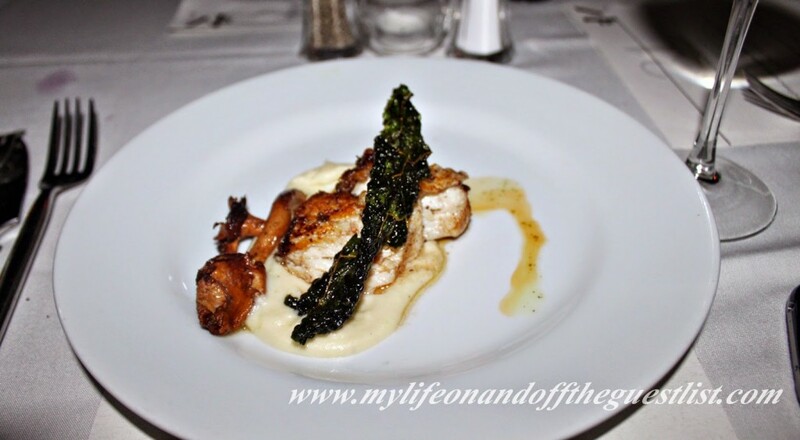 With each dish came a background story on the evolution of Italian cuisine or how Giuseppe creatively enhanced a particular dish before us. Glasgow: Getting to Astoria from New Jersey is one heck of a trip but I’d gladly do it over and over again to re-experience any of this wonderful meal lineup. The homey outside may look small, but it gives way to a long interior that’s both intimate and rustic. 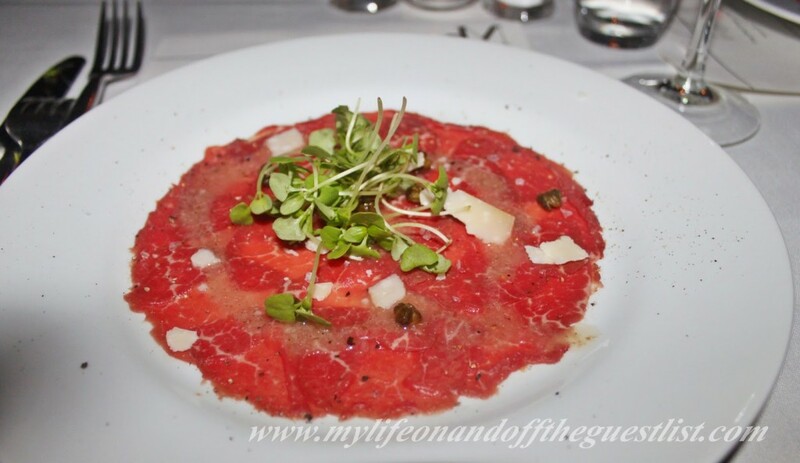 From the soft glow of the overhead lamps, to the draping red ceiling panels, wall decor of and Italian garden, and the open arms of the staff, we felt completely at home, almost as if we were enjoying a family dinner in Naples. I must also make note of the one kinds funny aspect of the restaurant. 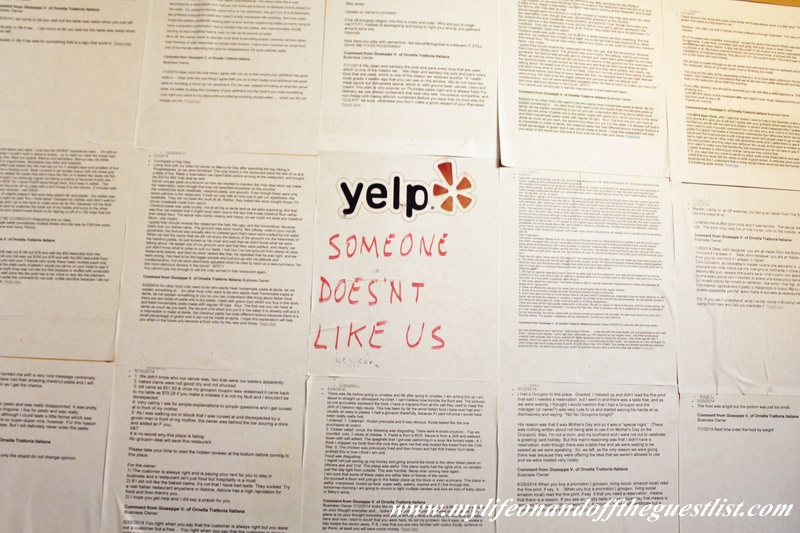 Giuseppe has plastered his restrooms with all the negative yelp reviews and his sometimes hilarious responses . 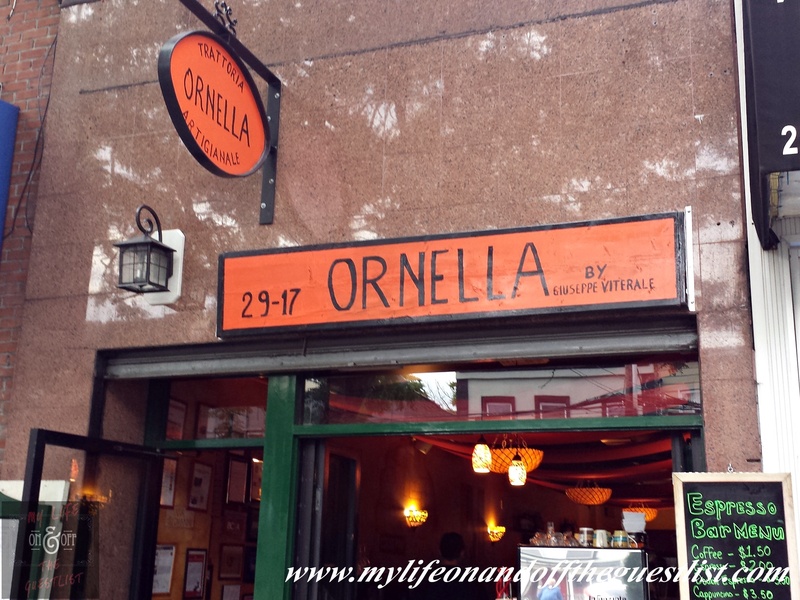 Chris: Wherever you hail from, make the trek to Ornella Trattoria. 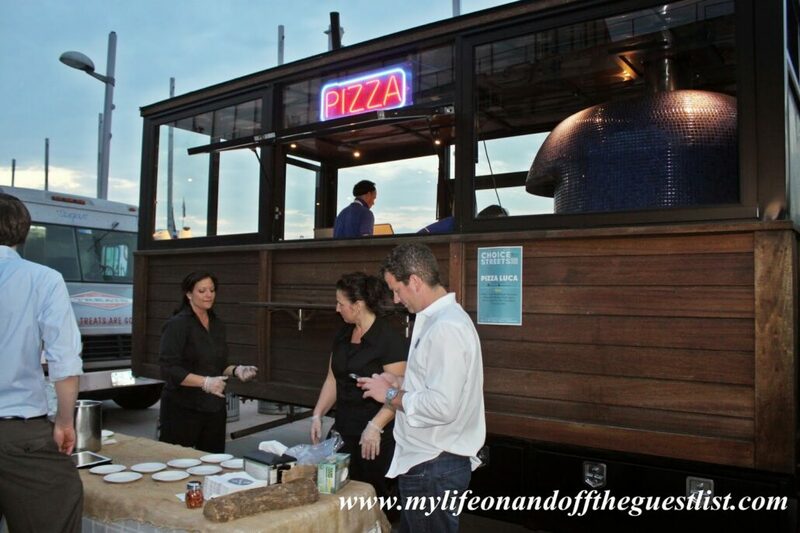 Bring a date, bring a friend, bring the entire family to a truly unique dining experience. Be forewarned, if you’re expecting the typical Italian fare of spaghetti and meatballs, stick to Little Italy. 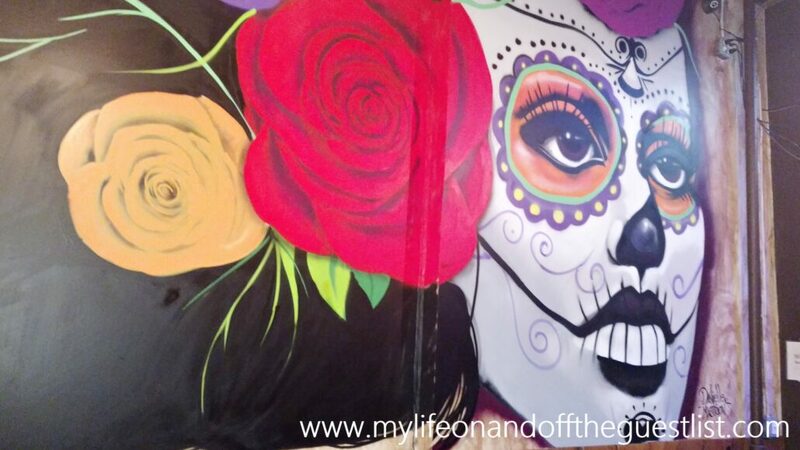 Come here with an open mind to try something new that your palette and stomach will be all the better for. While Ornella is rooted in tradition it is also a pioneer in ingenuity, mixing and enhancing flavors to create new and exciting dishes; which, as Giuseppe pointed out, can also be applied to life. 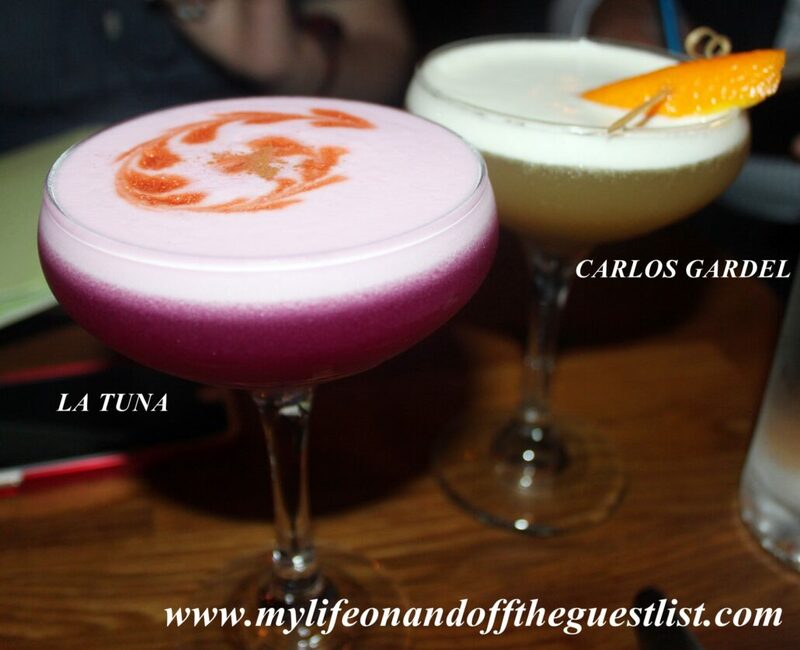 Glasgow: Go for the food, go for the knowledge, go for the incredibly service, go for the food (did we already say that? ), you won’t be disappointed. 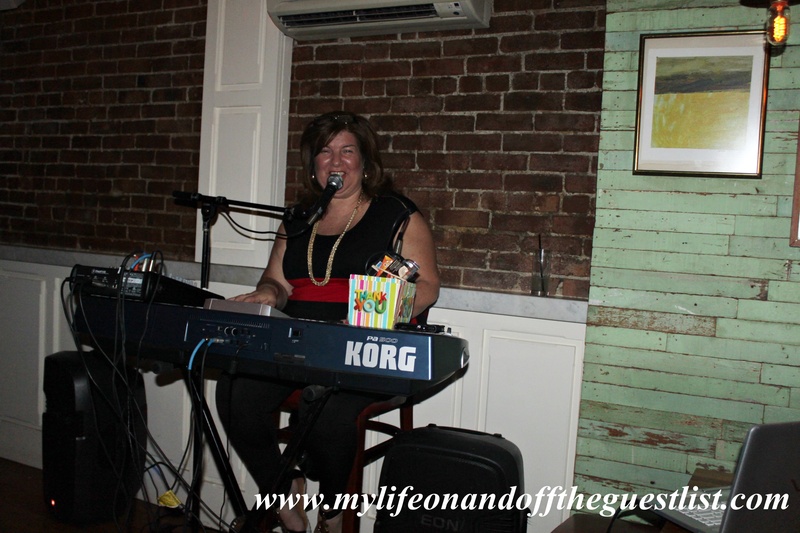 Any restaurant that has a soup DJ (yes, they do), and an owner that’s as excited to tell you about the food as you are to eat it is a must! As Chris said, don’t come expecting your typical lasagna or spaghetti and meatballs, you won’t find it here. 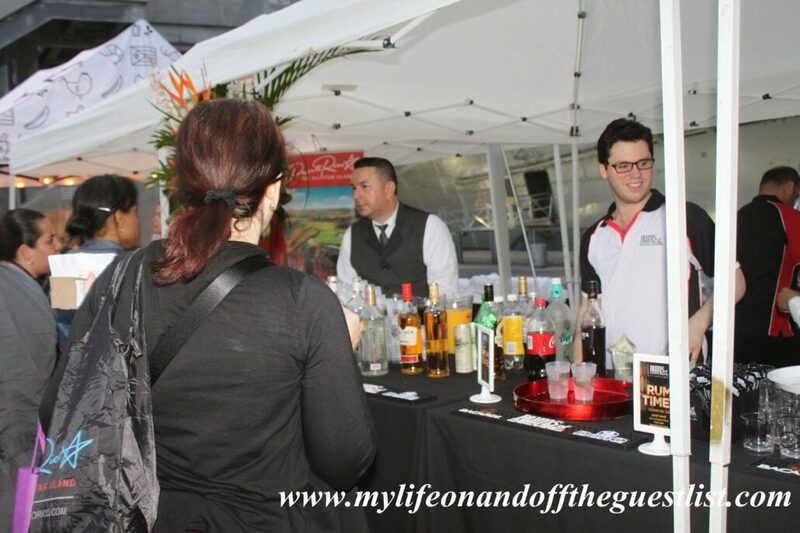 Instead you will find a delicious adventure that will leave you both sated and knowledgeable. After this experience, I find that it’s a wonderful thing to learn more about what you’re about to eat, it makes you enjoy your meal more. 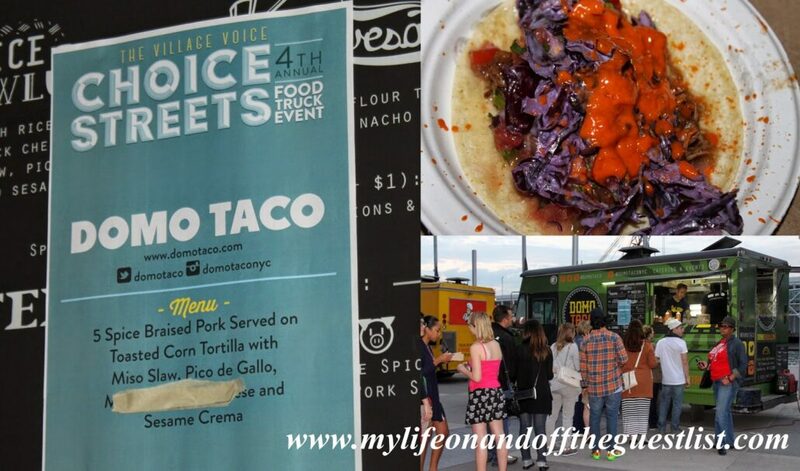 We discovered so many new favorite foods at the Village Voice’s Choice Streets Fourth Annual Food Trucks Event. 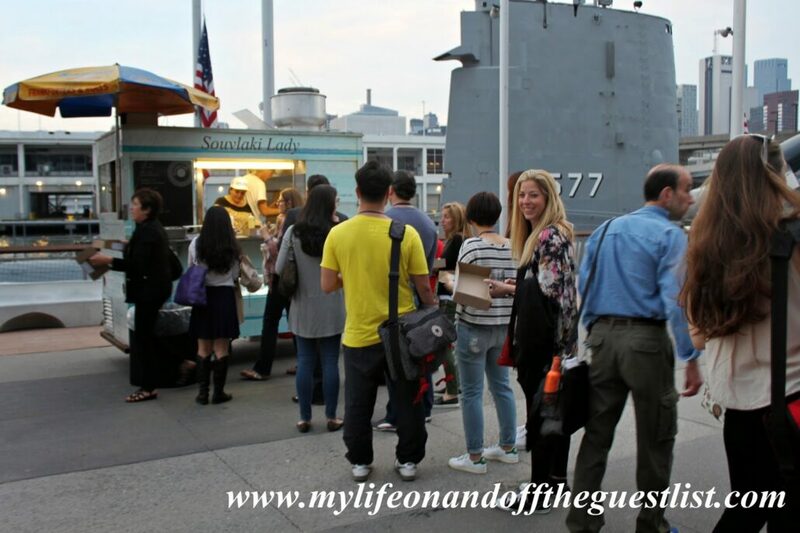 Once again, it was food trucks galore as we descended upon the Intrepid Sea, Air & Space Museum on Pier 86 on Cinco de Mayo. 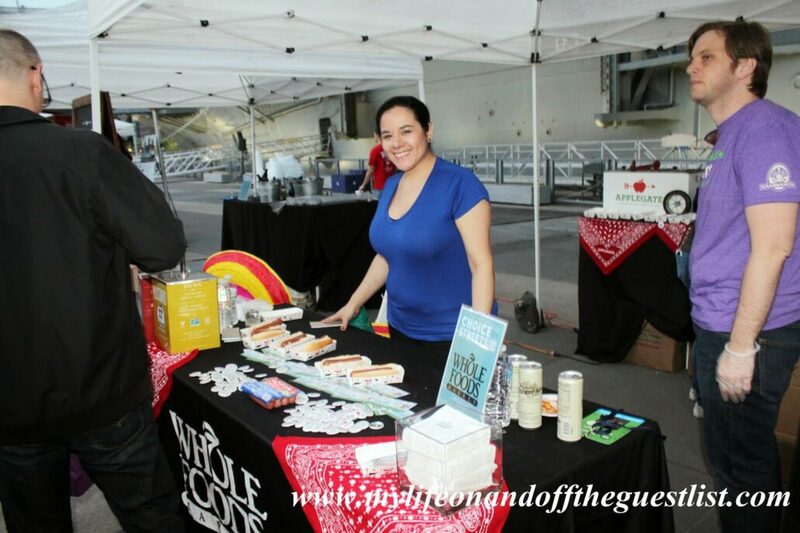 We were determined to beat our poor performance last year and enjoy as many food truck food varieties as we could. It literally was foodie heaven being surrounded by all these food trucks at Choice Streets. 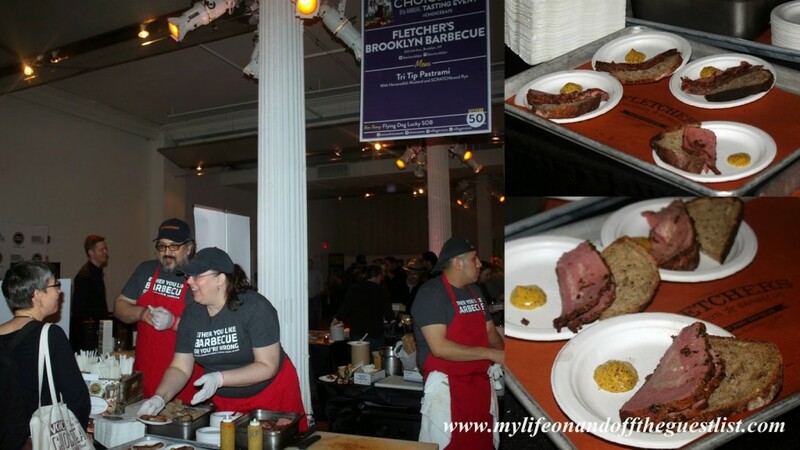 Sadly we didn’t meet our goal of surpassing last year’s count, but this time, it’s because the event was packed, much more than last year, with scores of more people waiting to enter and indulge in this gastronomical feast. 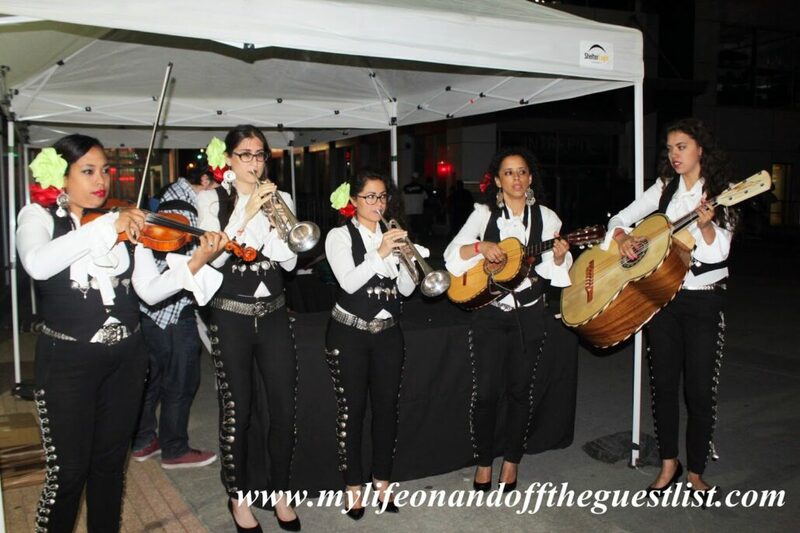 Since the event was held on Cinco de Mayo, attendees were entertained with live music from Mariachi Flor de Toloache (pictured above), New York’s first and only all-female mariachi band. 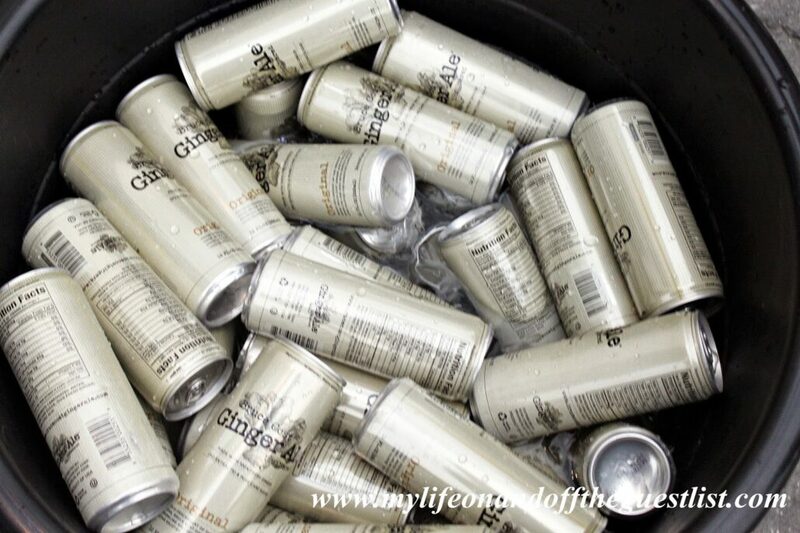 Before we began to indulge, we stopped in at the Bruce Cost Ginger Ale booth to arm ourselves with this delicious, and sparkling beverage made with fresh whole ginger that’s great for digestive comfort and our over indulgence. 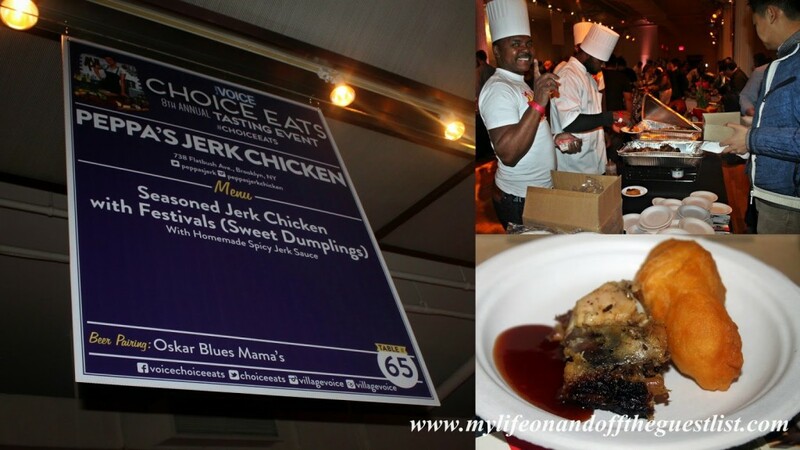 With disposable tray and Bruce Cost ginger ale in our hands, we began our foodie journey. 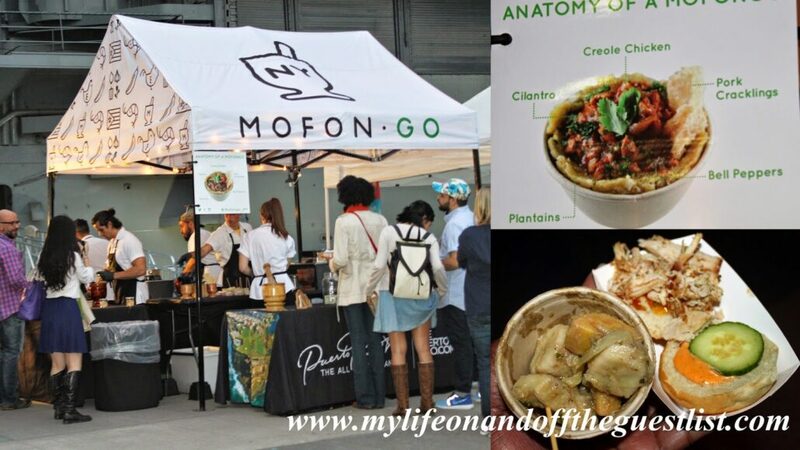 Although they were not food trucks, we had to make a stop at Mofongo NY, who was there on behalf of Puerto Rico Tourism, serving up food so good, they had the longest line for the entire event (we easily waited an hour but it was so worth it), and the Whole Foods, who were sampling delicious Applegate Hotdogs. From there we went on to hitting the food trucks. 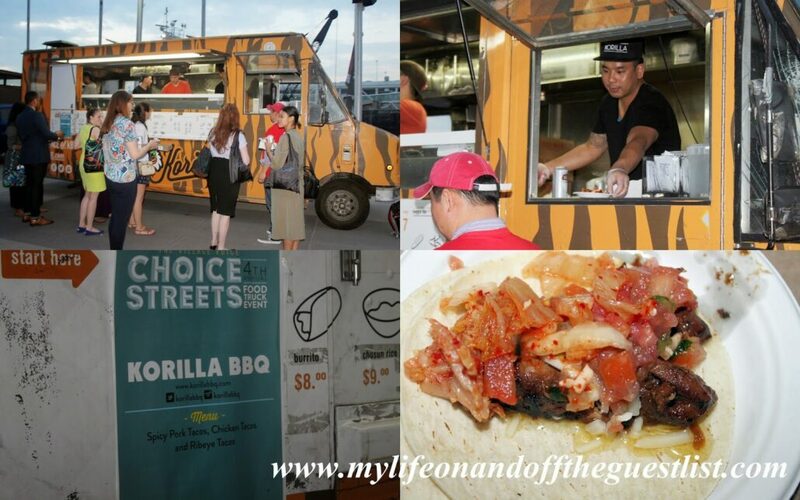 Our first stop was to Korilla BBQ who offered three taco variations – Spicy Pork tacos, Chicken tacos, and Ribeye Tacos. We decided to go with the Ribeye Taco, which was so incredibly divine; the steak melted in your mouth and left you wanting more. 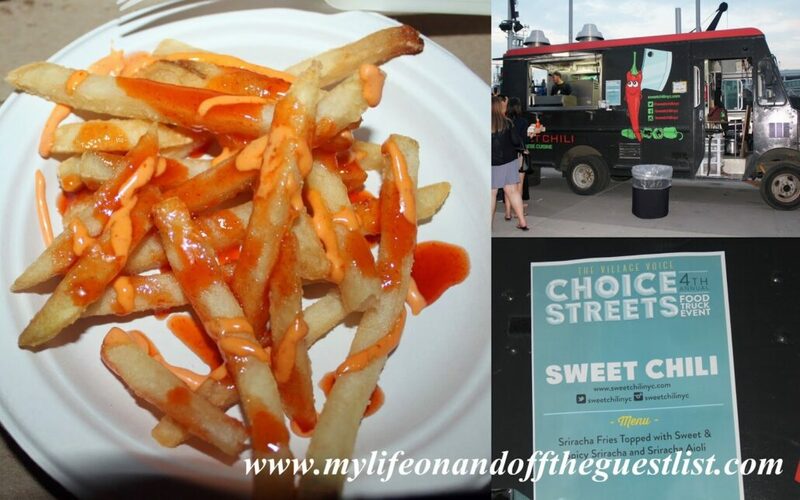 Our next stop was to Sweet Chili and their peppery offering of Sriracha Fries Topped with Sweet and Spicy Sriracha and Sriracha Aioli. We’ve never been one for pepper, but the combination of sweet and spicy added some flavorful heat to our already delicious fries. 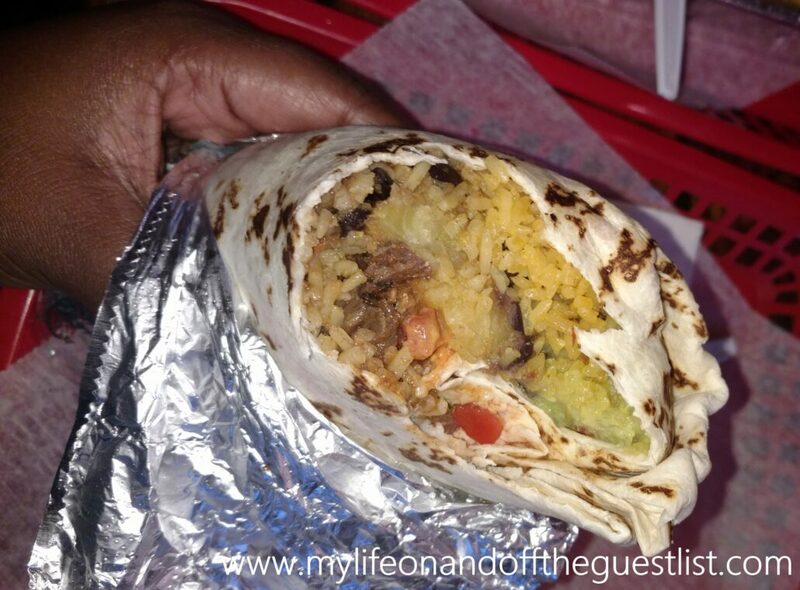 From Sweet Chili, it was on to something a bit more sweet but equally savory. 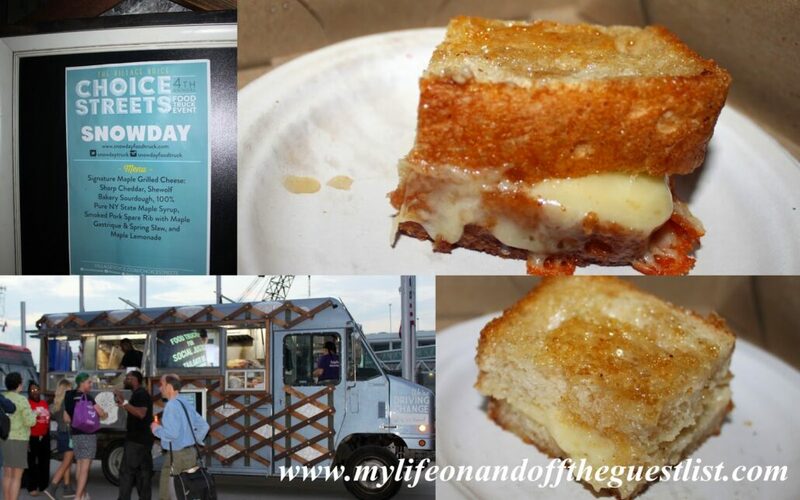 We heard so many great things about SnowDay‘s Grilled Cheese, we had to make it our next stop. 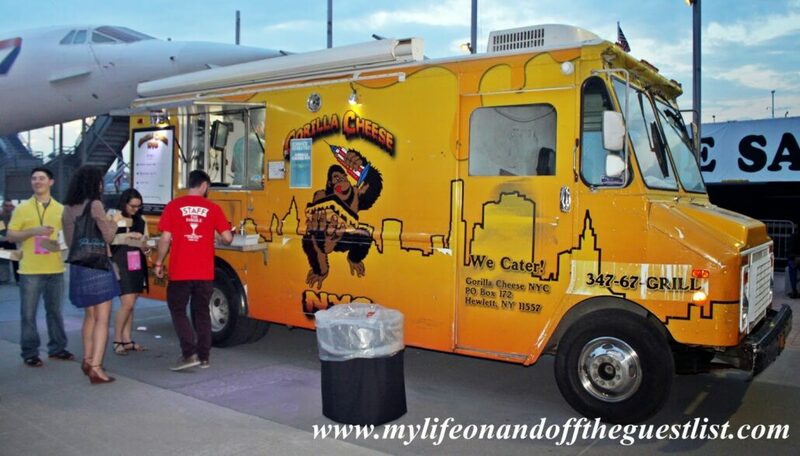 This standout food truck offered their Signature Maple Grilled Cheese, which includes sharp cheddar, Shewolf Bakery sourdough, 100% pure NY State maple syrup, Smoked Pork Spare Rib with Maple Gastrique and Spring Slaw, and Maple Lemonade. 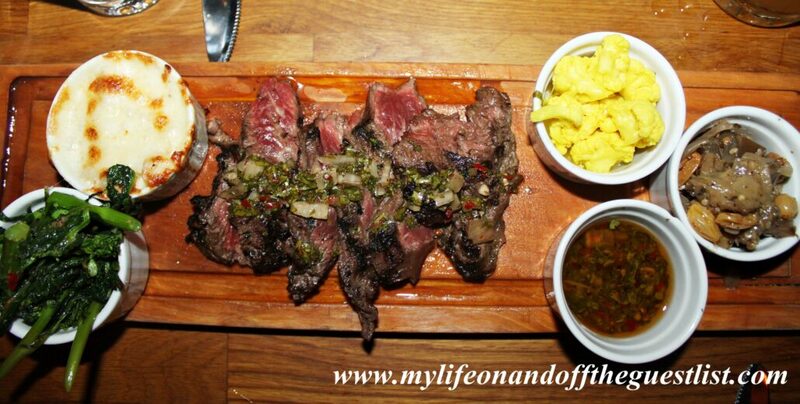 Besides the Mofongo, this was easily our favorite dish of the night. 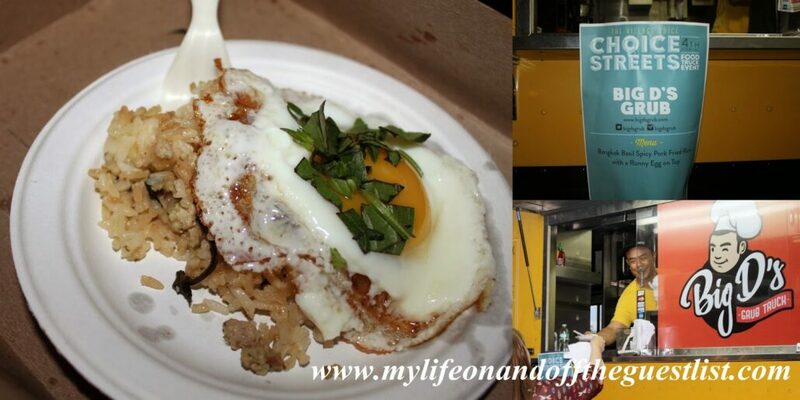 Our next stop was to Big D’s Grub Truck, offering the nights’ most unique dish, Bangkok Basil Spicy Pork fried Rice with a Runny Egg on Top. This definitely made our top five favorite food experiences for the night, and if we were able to, we would’ve gone back for seconds. Of course by this time, we were already starting to feel the seams of our jeans, even with the overwhelming long lines, we were reaching our limit; with room for one for dish, and armed with more Bruce Cost Ginger Ale, we headed over to Domo Taco, and their 5 Spice Braised Pork Served on Toasted Corn Tortilla with Miso Slaw, Pico de Gallo, and Sesame Crema. 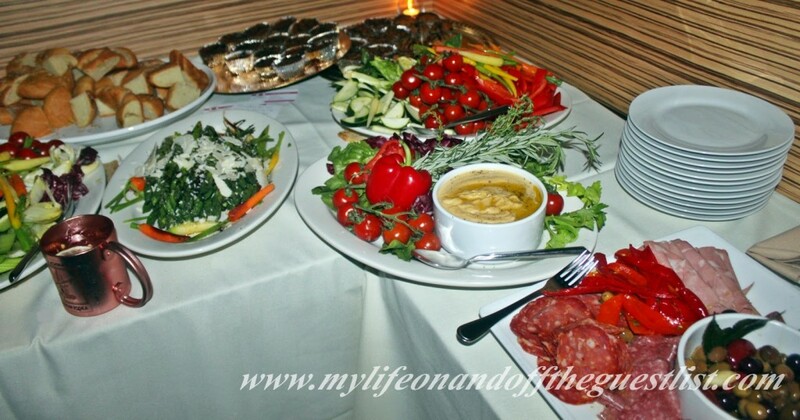 Of course, we can’t have a hearty meals with a spirit or two to compliment the variety of cuisines. 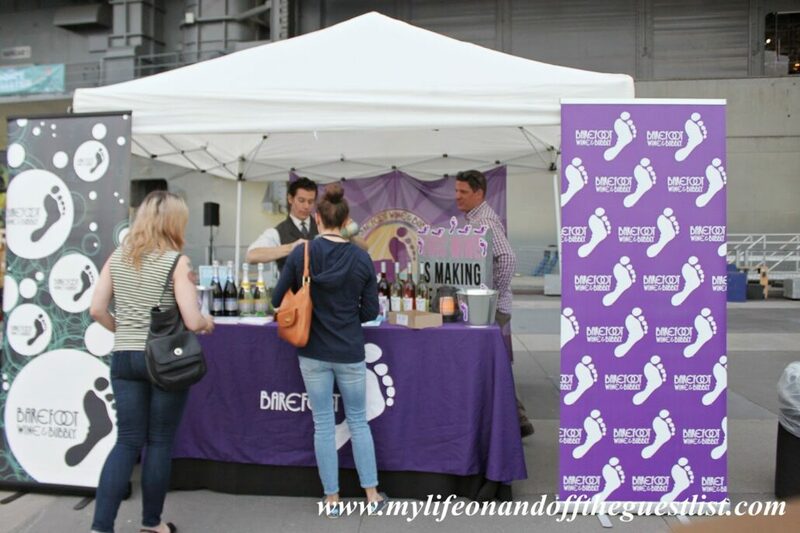 On hand to keep libations flowing were Barefoot Wines, New Amsterdam Vodka, and Rums of Puerto Rico, etc. 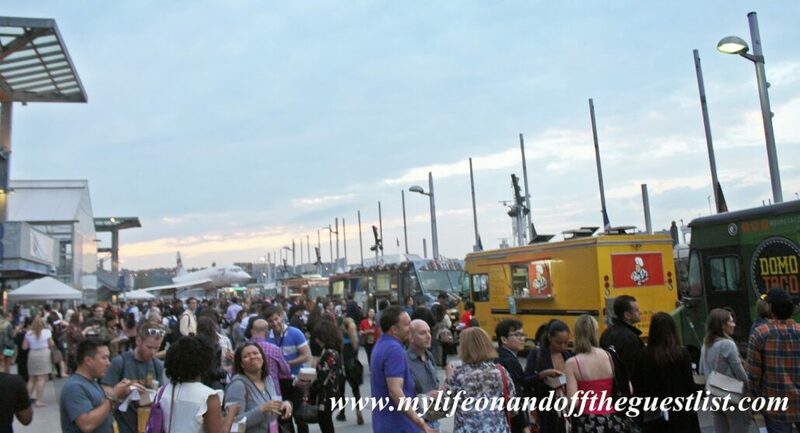 As always we had a great time at the Choice Streets Fourth Annual Food Trucks Event, it truly is a food lover’s culinary fantasy. 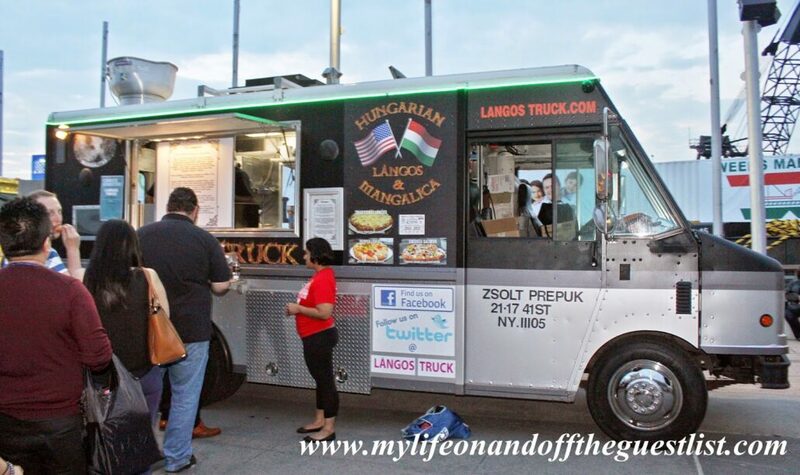 Tell us, have you ever been to Choice Streets, are any of these food trucks favorites of yours? 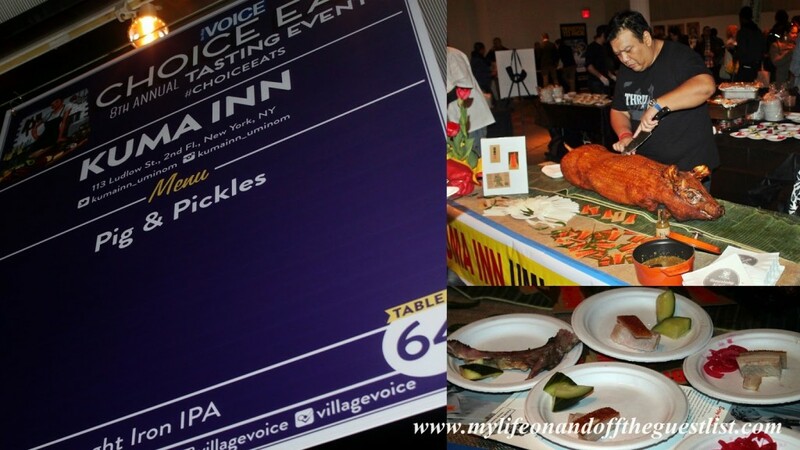 Foodies from around the tri-state area converged on the Metropolitan Pavilion to once again partake in the extraordinary gastronomy experience that was the Village Voice Eighth Annual “Choice Eats” Tasting Event. 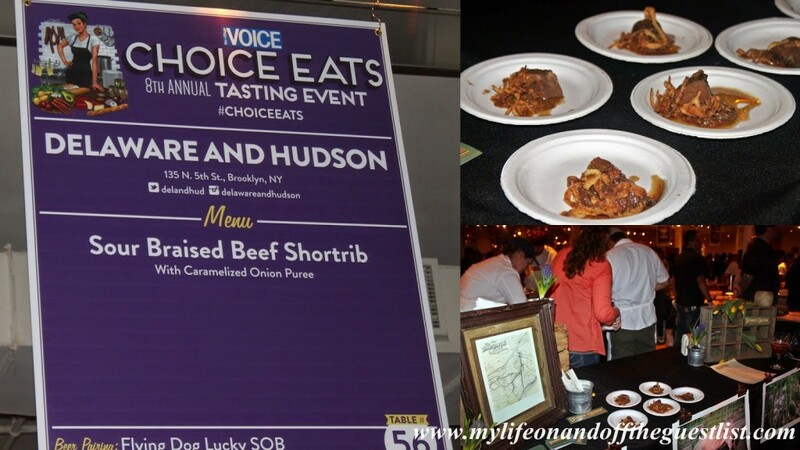 With well over 60 participating restaurants that were handpicked from all five NYC boroughs, Choice Eats did not disappoint attendees who enjoyed unlimited sampling of the restaurants’ best mouthwatering dishes, indulgent desserts, complimentary craft beer pairings, wine and liquor beverages. We had the pleasuring of once again attending this illustrious event and feasted as much as we could without going into a food coma. 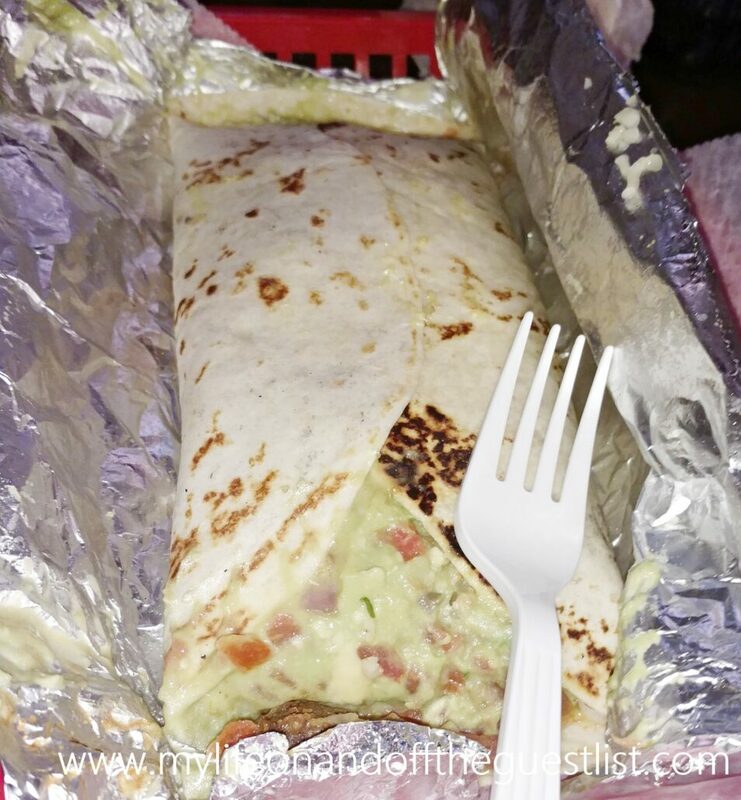 Our food journey started led us to old familiar favorites like The Kati Roll Company, Luke’s Lobster, Doughnut Plant, and Carlo’s Bakery, but we also discovered lots of new yummy loves as well. 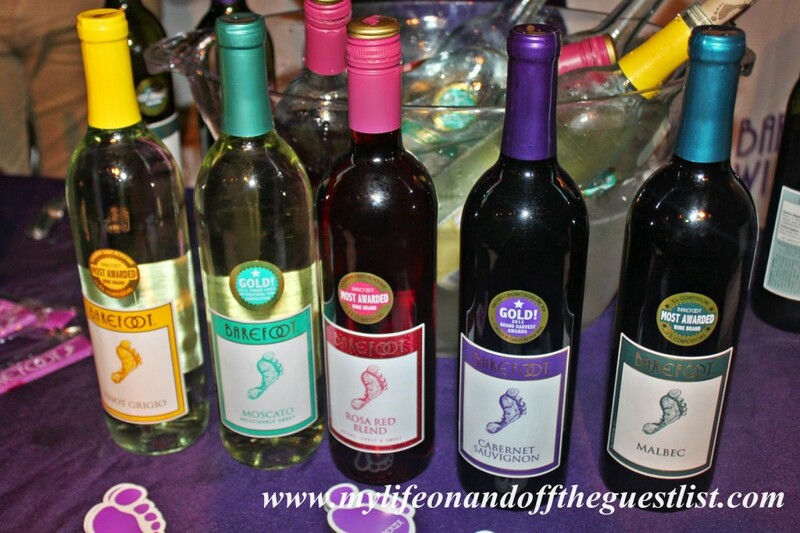 Join us in drooling over some of what we enjoyed. 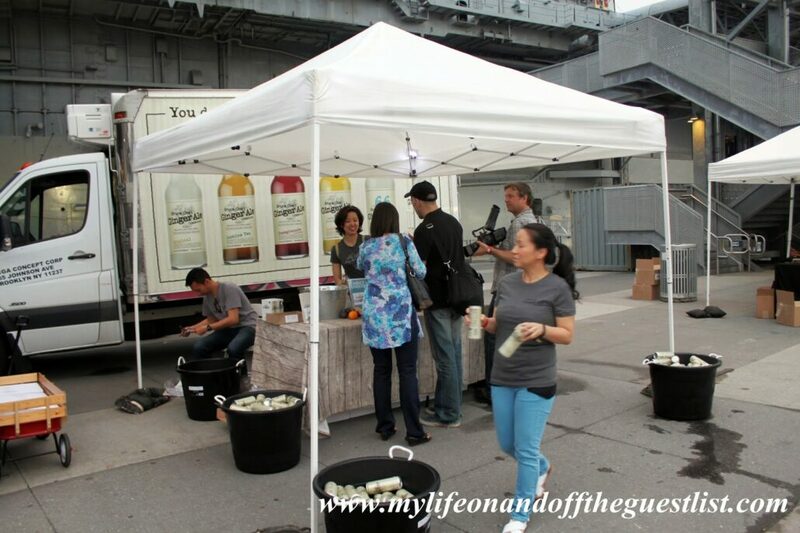 We indulged in some many delicious fare that we had to take breaks and walk around in between sampling just to help our digestion efforts. 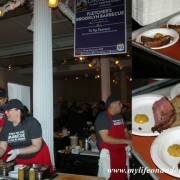 This proved to be a wonderful plan, because we got to enjoy much more than we did at last year’s Choice Eats. 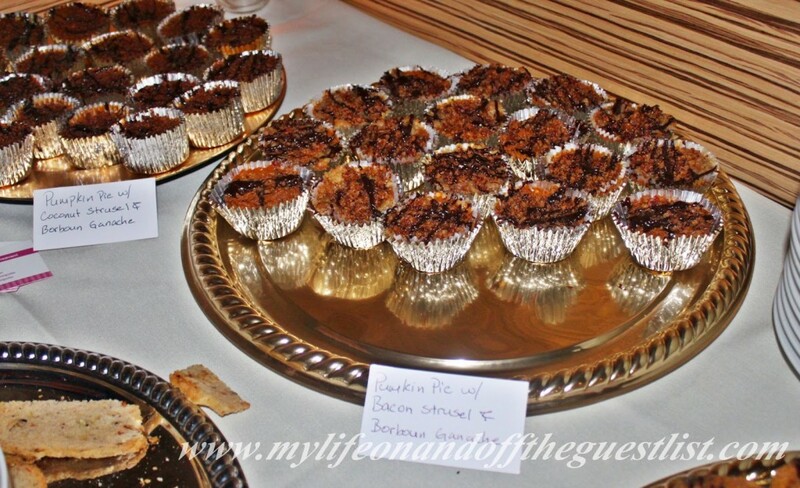 After indulging in the above savory dishes, it was time to move upstairs to surrender to a few decadent desserts and get to know the Choice Sweets section of the event. We devoured the delicious samples from Tate’s Bake Shop, Fay Da Bakery, Sugar Couture, Butter Lane, Luca & Bosco, Carlo’s Bakery, Doughnut Plant, Robicelli’s, and Butter & Scotch. Full food coma was achieved when we got home after the event and we wouldn’t trade that experience for anything in the world. 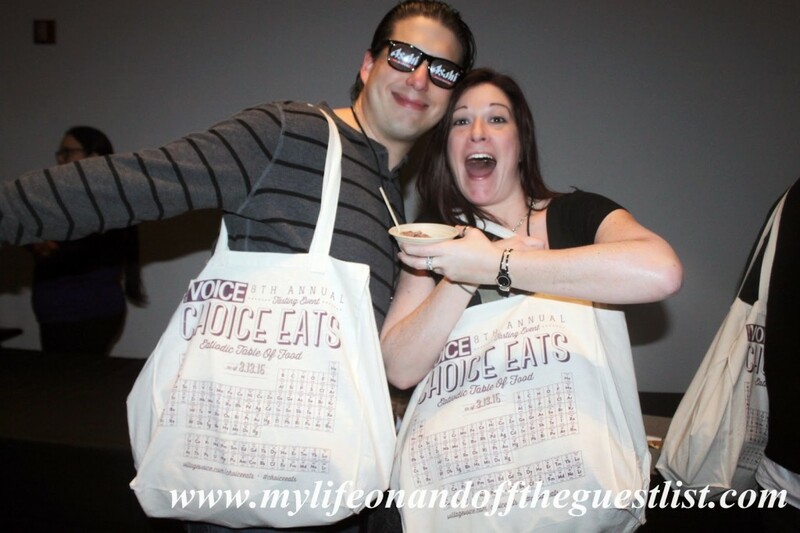 Choice Eats is a must for foodies, or anyone who wants to discover new restaurants or flavors. You should add it to your “must-go-to” list immediately. 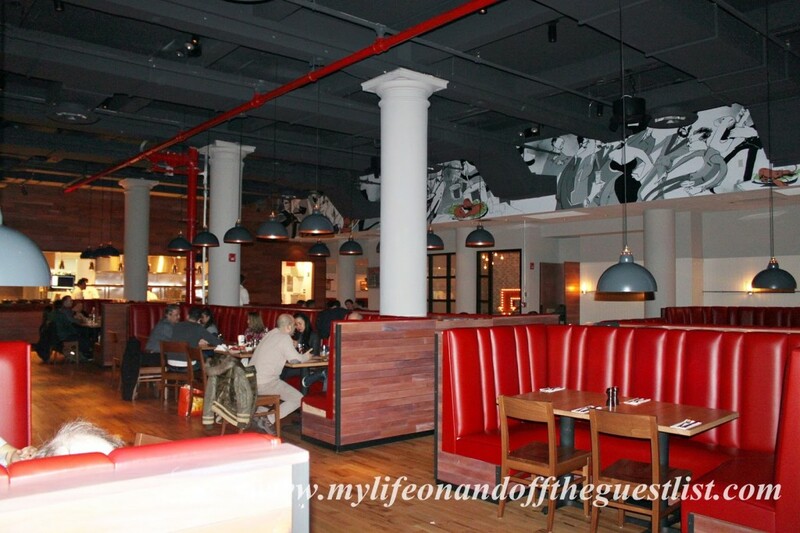 We love discovering new, amazing places to dine, and our latest favorite culinary indulgence, Burger & Lobster NYC, is an UK import that offers two only entrees – Burgers and Lobsters (hence the name), at what is a beyond an amazing price. 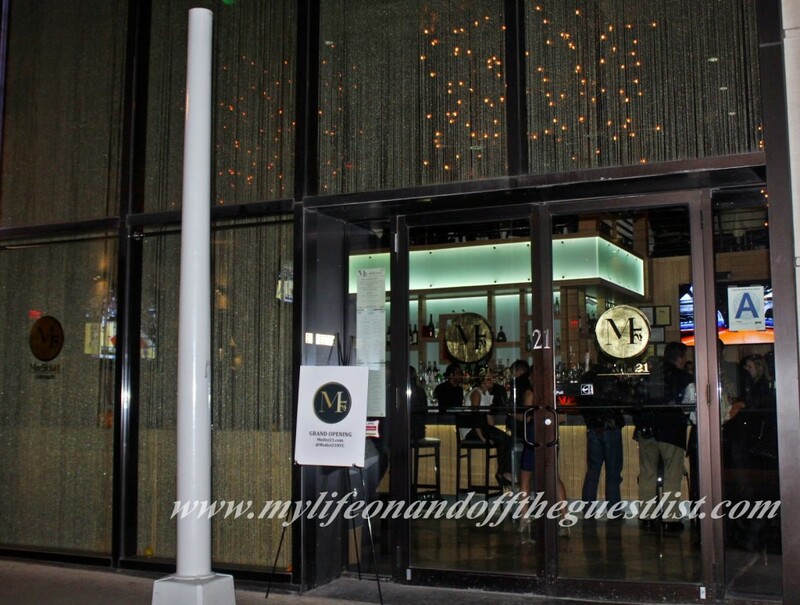 The gigantic restaurant is perfect for a night out with family, friends, or that special someone. And since it’s Valentine’s Day, what better time than to indulge your sweetheart to a fantastic meal for only $20.00 per entree. 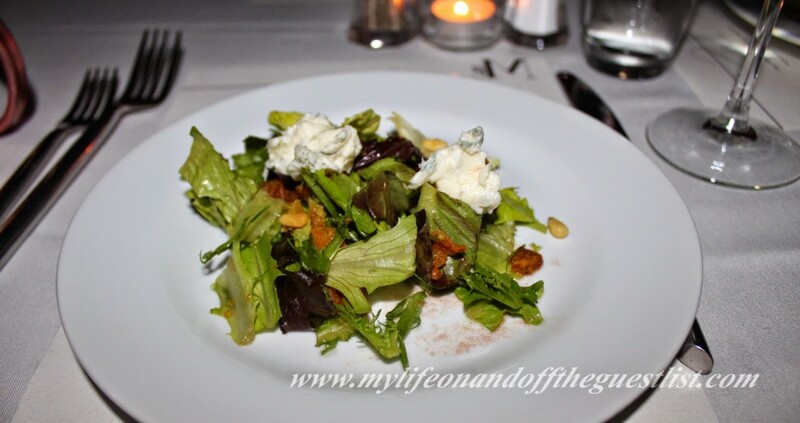 My blogger buddy, Christine Ongsueng, accompanied me to experience this simple but memorable menu. Although there is a menu for drinks, a physical menu for the entrees is not needed, rather the servers become walking menus, delighting you with tales of their experiences while indulging in the amazing culinary offerings. 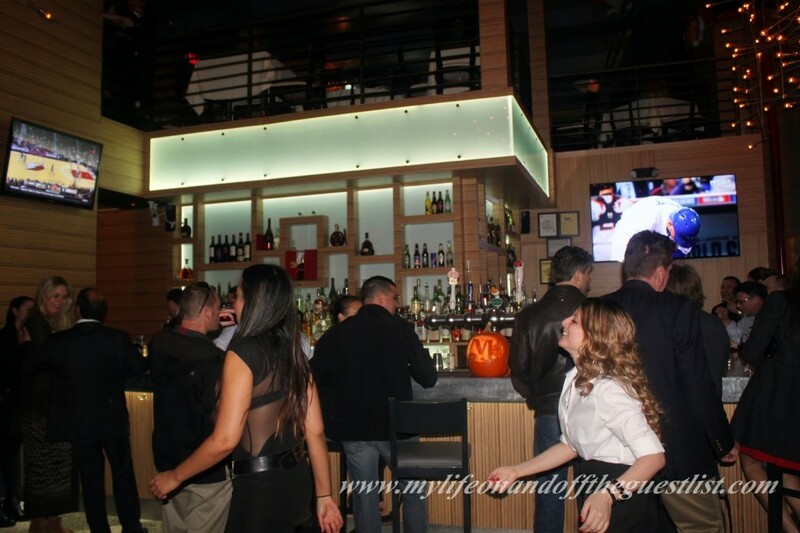 Below is our take on everything from the food, to the decor, to the super friendly and inviting staff. 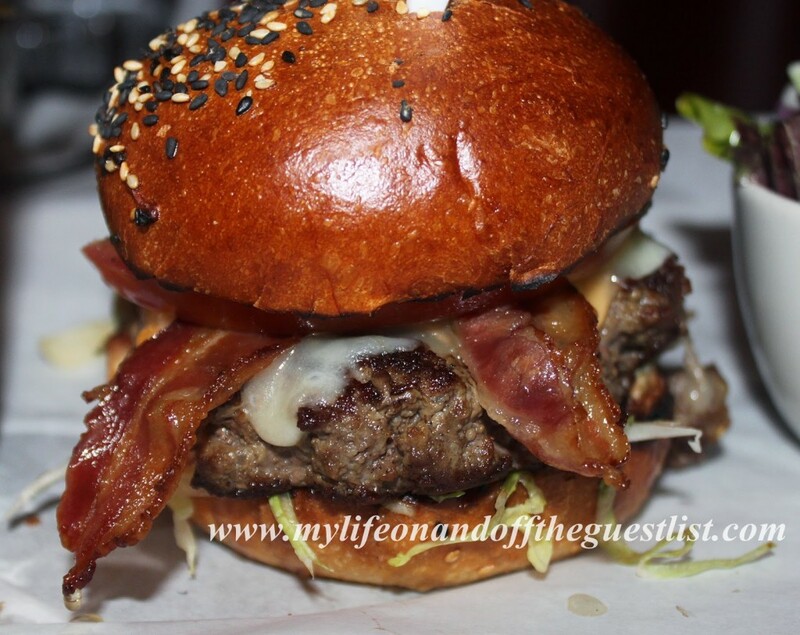 Glasgow/Chris: The burgers are so flavorful and delicious, it should be a sin to indulge so greatly. Made from three cuts of steak – 60% Chuck, 20% brisket, 20% tri-tip, and topped with cheese and bacon in a bun that’s good enough to be consumed by itself, you may just find yourself surrendering to this Juicy, tender, and flavorsome burger. Chris: This is not your average $20.00 rinky dink lobster roll slathered in mayo. 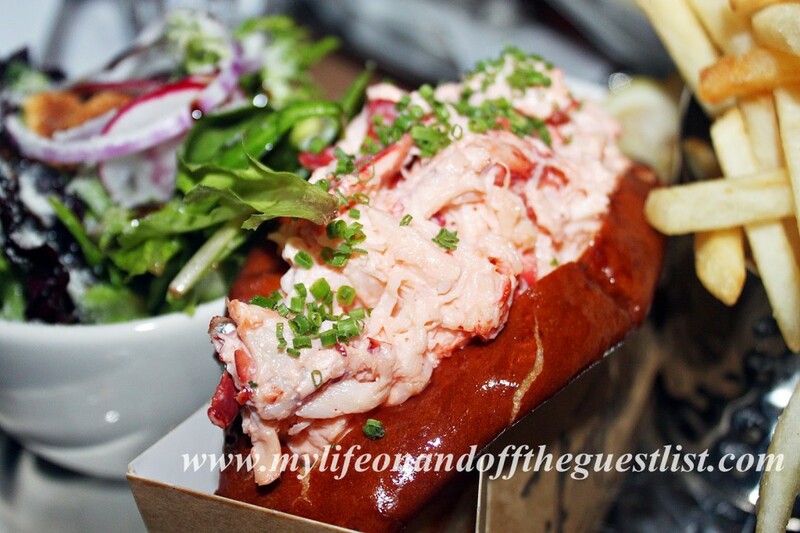 This is the best lobster roll I’ve had to date and I’ve tried quite a few around the city. First off, every square inch of the bread is covered in huge chunks of lobster meat. There was no stinting here! 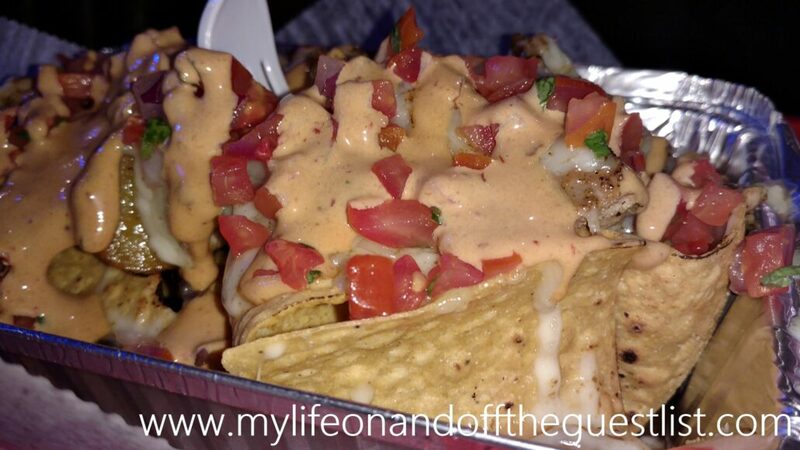 Most places give you a scoop full of lobster slathered in some thick goopy dressing. These lobster rolls are not heavy on the dressing. 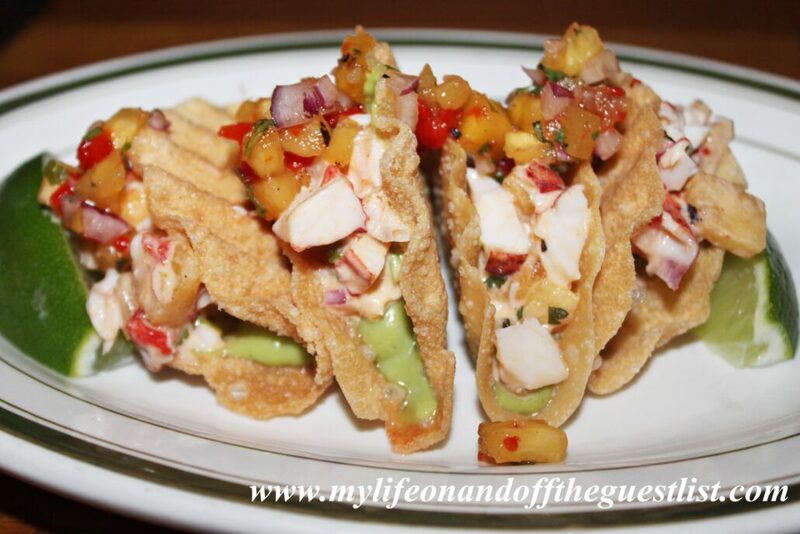 In fact, the sauce enhances the flavors of the lobster instead of masking them. Glasgow: Where do I begin? Shall I begin with the brioche bun that will make you want everything you ever eat from now on to come on a brioche bun, or maybe the instant feeling of “this is what my life has been missing” upon the first bite, or how about the 1/2 pound of the most succulent, buttery lobster I’ve ever experienced. 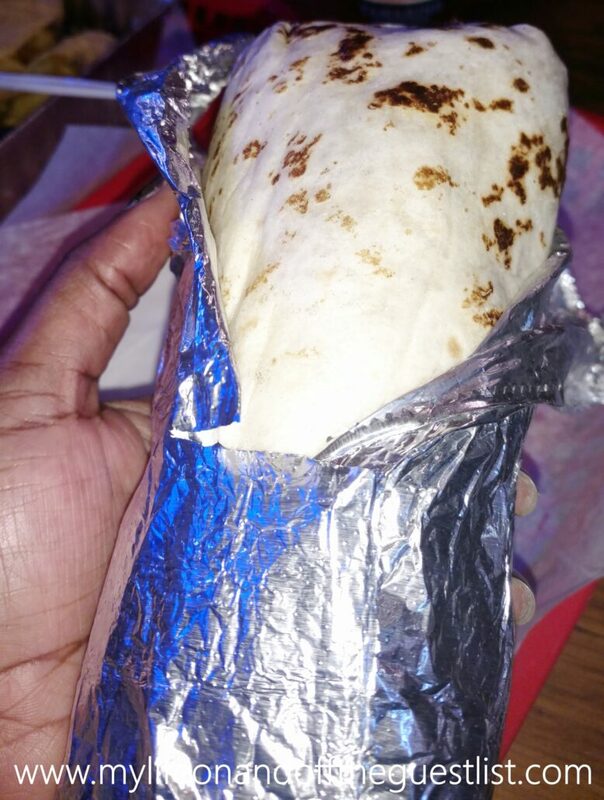 Yes, I can talk about all these things, but nothing could properly prepare you for that magic moment when your taste buds surrender to this savory decadence. 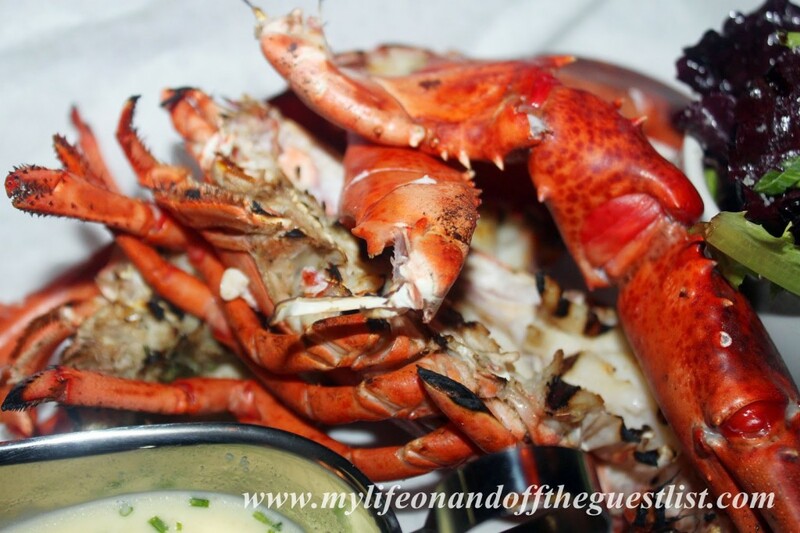 Chris: You can have the lobster your way– steamed or grilled. We opted for the latter and couldn’t have been happier with our choice. Yet another behemoth of pure tastiness. This was no junior lobster. This was 1.5lbs of grilled goodness. The natural taste of the lobster meat is elevated by the smokey grilled method. 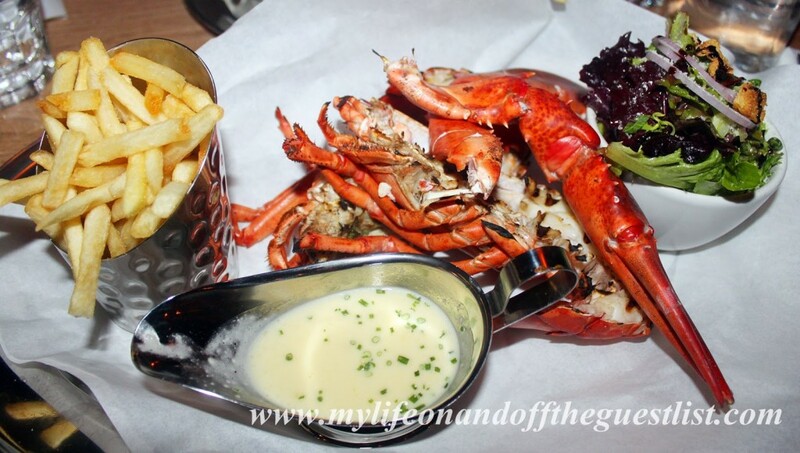 But as if things could not get any better, there’s the golden butter garlic sauce in which to bathe your lobster in. More than just melted butter, this dipping sauce contains a mix of seasonings that are embedded into the butter without coagulation. Glasgow: This was the best tasting and freshest Lobster I’ve ever had. The two choices of lobster preparation will leave you in a delicious conundrum. Fans of steamed lobster will surrender to the intensity of flavor that the smokiness of fire brings forth in the grilled version while fans of grilled lobster will want to savor the sweetness and tenderness of the lobster meat that steaming provides. 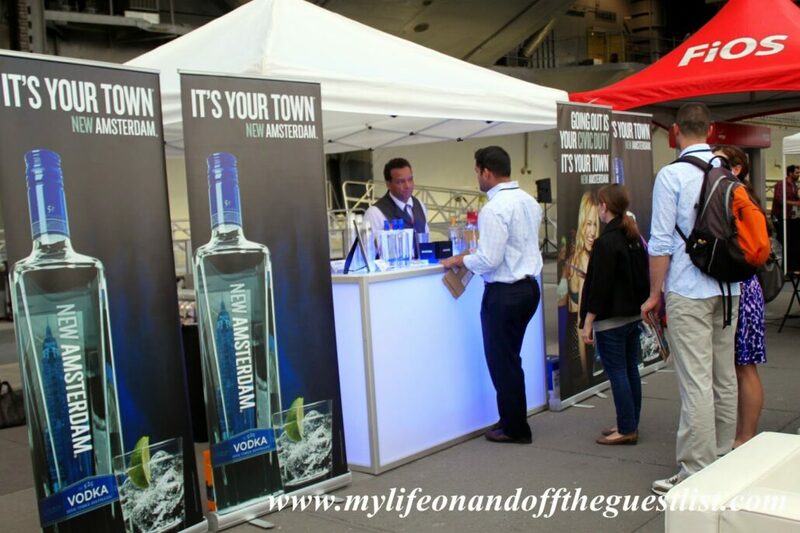 Whichever one you choose, you can’t go wrong, although you will find yourself wanting to try both. 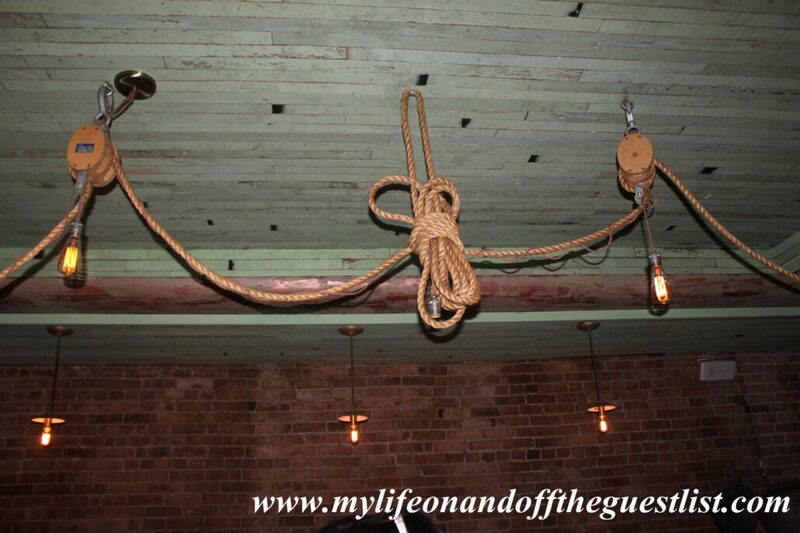 Chris: Normally, huge restaurants run the risk of being too bare or being over saturated with tacky decor. Thankfully, that was not the case at burger and lobster. 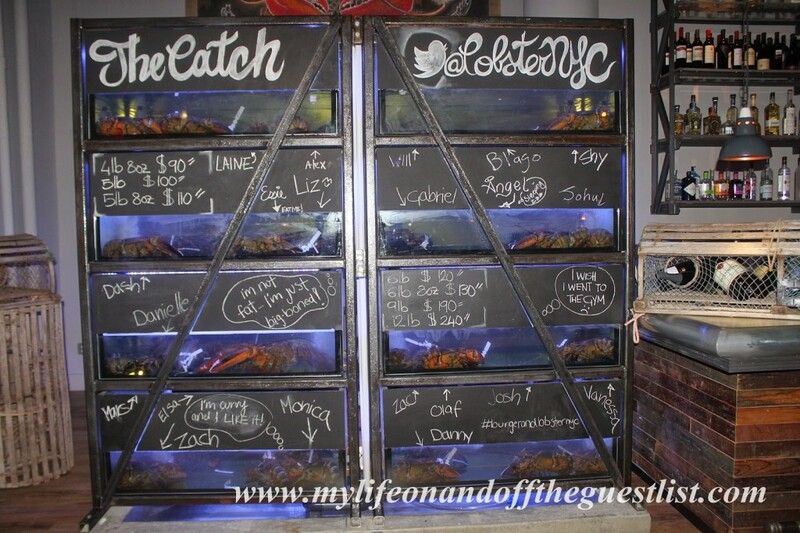 Upon entering, one is greeted by a huge tank of lobsters whose names are cheekily written in chalk above their heads. 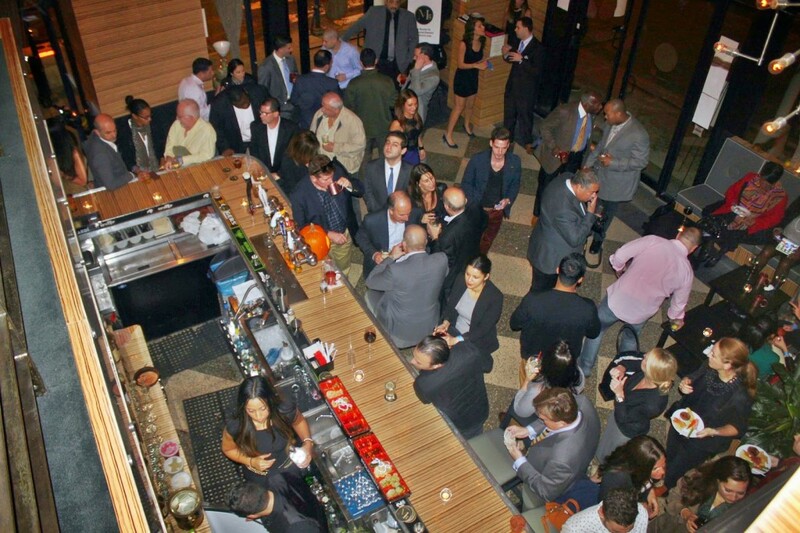 The long bar is impressive in its size and sleekness; makes waiting for a table more tolerable and less likely to get you jostled while ordering a drink. Lobster traps are used as a subtle but impressive wall barriers. 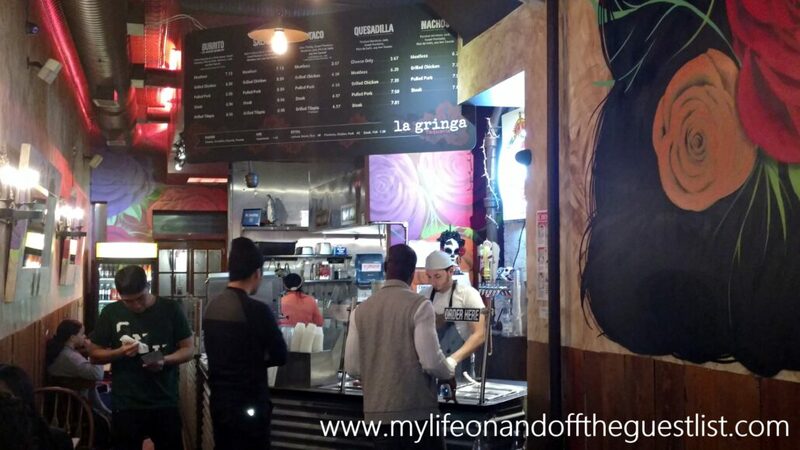 The wide aisles in between the booths make it easier for servers balancing platters of deliciousness to pass through without having to disturb the customers. There’s also a downstairs seating area complete with its own bar and a full view of the lobster containers—over 4,000 lobsters can be housed in climate-controlled blue crates! Glasgow: I was amazed to find how a space so incredibly huge can be so intimate and open at the same time. It really is the perfect place to have a group dinner, romantic meal (another reminder it’s Valentine’s Day), or get-together with friends. 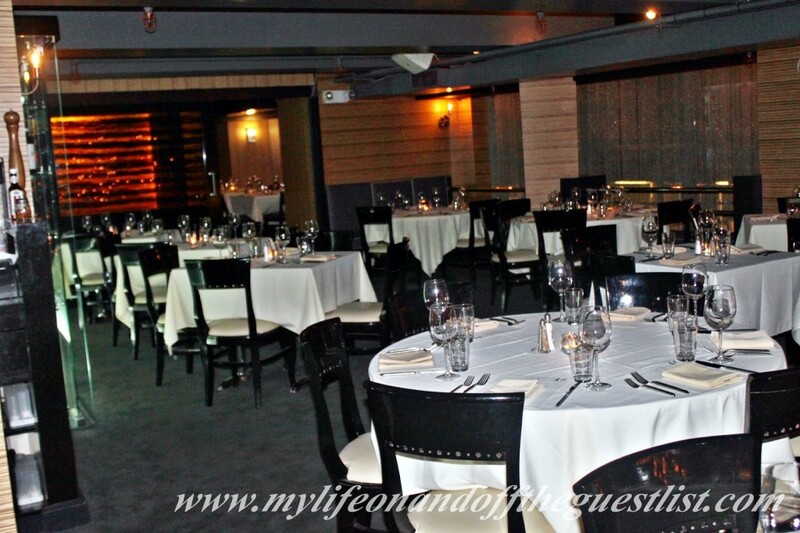 The layout offers the option of a private dinner and neighbor interaction, it’s up to you. 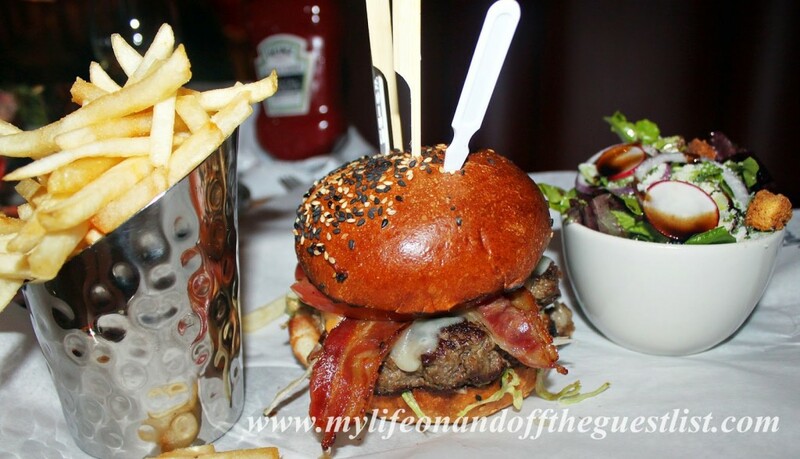 One very notable moment was getting up close and personal with one of Burger & Lobster NYC’s Big Boys. They are huge and have the most adorable phrases written on their tanks. 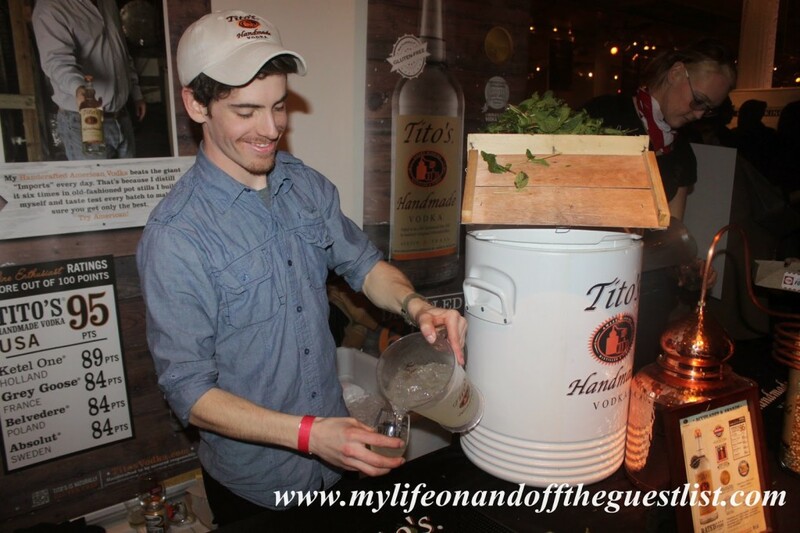 Chris: The staff is one of the nicest I’ve ever encountered. 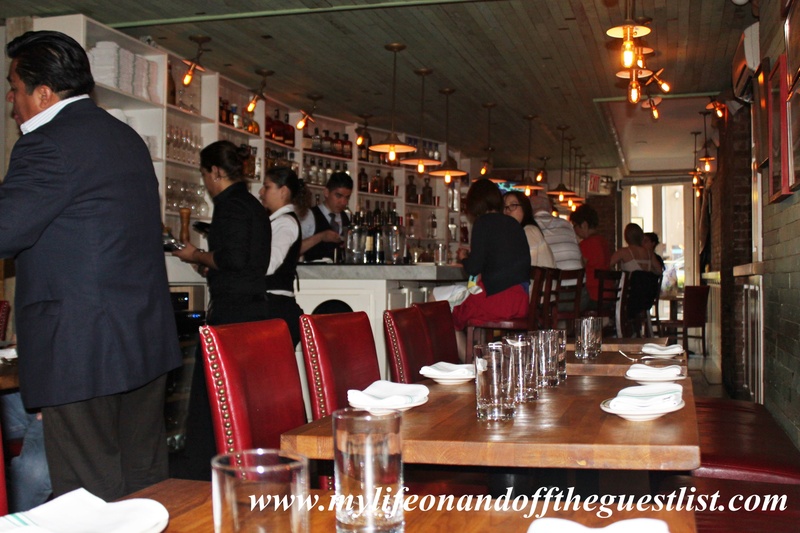 From the pure jovial nature of the hostess to the knowledgeable and entertaining waiter. 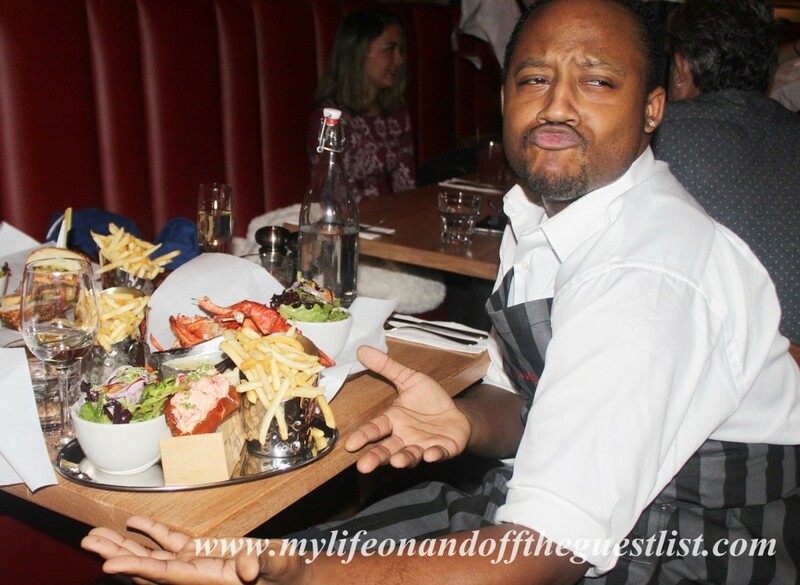 The staff at Burger & Lobster NYC know just how to make their customers feel special and at home. They are attentive without overbearing and their attitudes were authentic and sweet. Through our server, Edward, we learned all about the food we were being served as well as the fact that they treat the staff very well. It’s no wonder they came across utterly genuine. Glasgow: Let me begin by saying we both fell instantly in love with Edward and didn’t want to share him with the other diners. 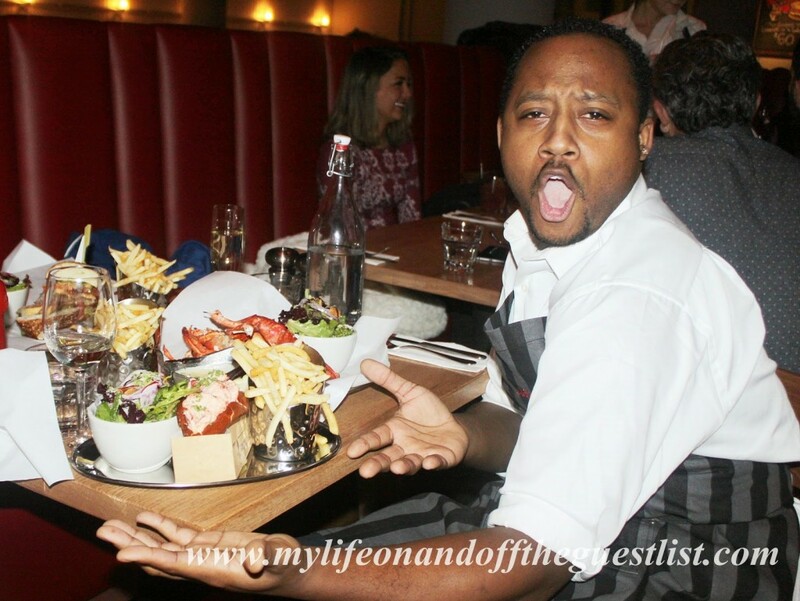 We asked to take a photo with our meal and the above is what we got…how can you not love him for that? It felt like we were having dinner with an old friend as he told us which meal was his favorite, the “problems” of having to taste test everything (hilariously sarcastic), and the love of his job. 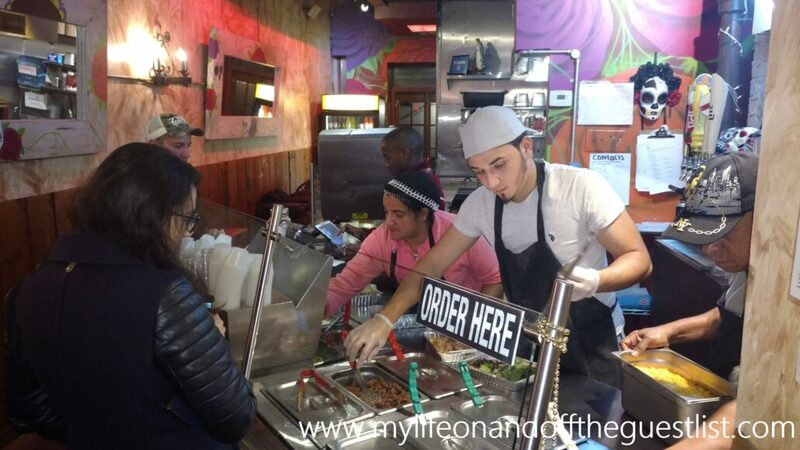 And though Edward was our server, we were visited by other staff who just wanted to say hello and laugh with us a bit….such an amazing friendly environment and people who really love what they do. 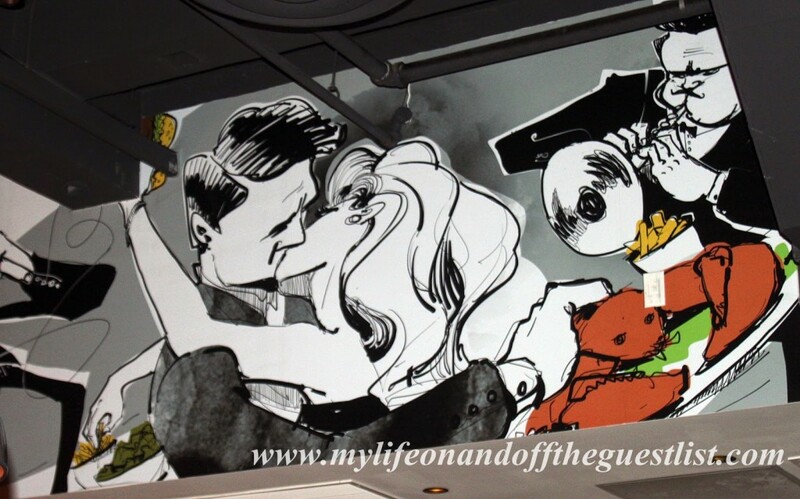 Chris: Russian artist, Alexandr Grigorev, has been commissioned by Burger & Lobster to do all of their artwork. Everything from the logo to the bibs to the murals that grace the sides of the high ceilings are done by Alexandr Grigorev. 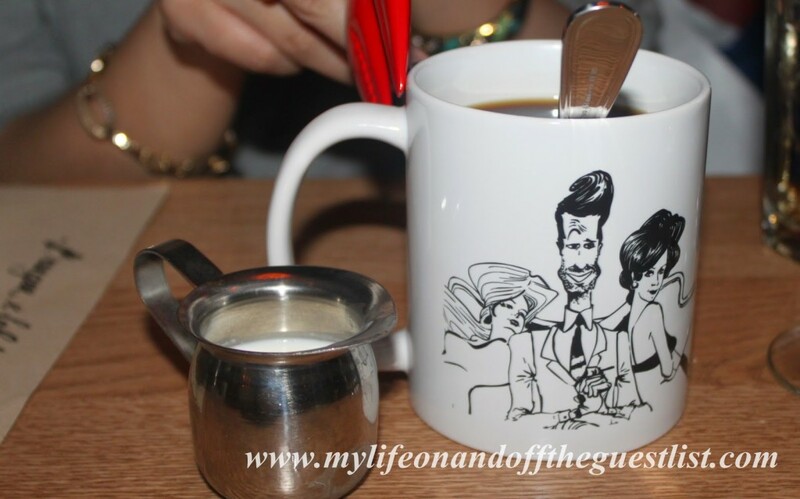 I absolutely fell in love with his oddly classic but modern caricatures of an array of different people. Glasgow: Chris definitely says it best here on the artwork. As for me, what can I say? I love all things cheeky, and the raised eyebrow shown on the mug is dong things to me lol. I see so much in these pieces from Alexandr Grigorev and I think that’s the point. So there’s our take. 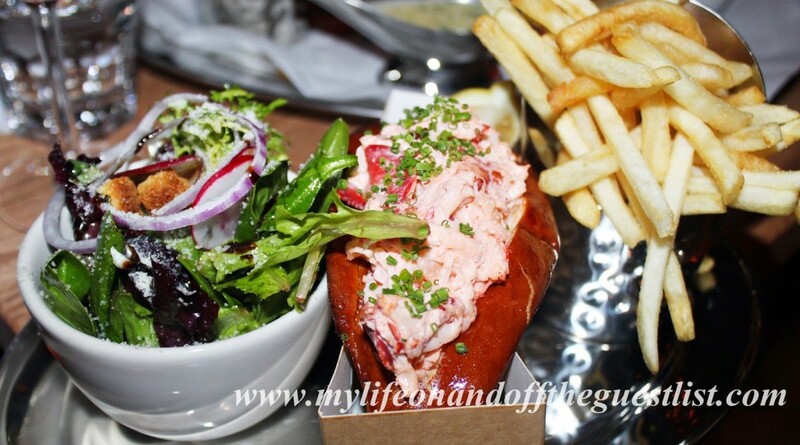 All of this is what you get the low cost of $20.00 per entree at Burger & Lobster NYC. I bet you to find a better deal or better meal for that price. 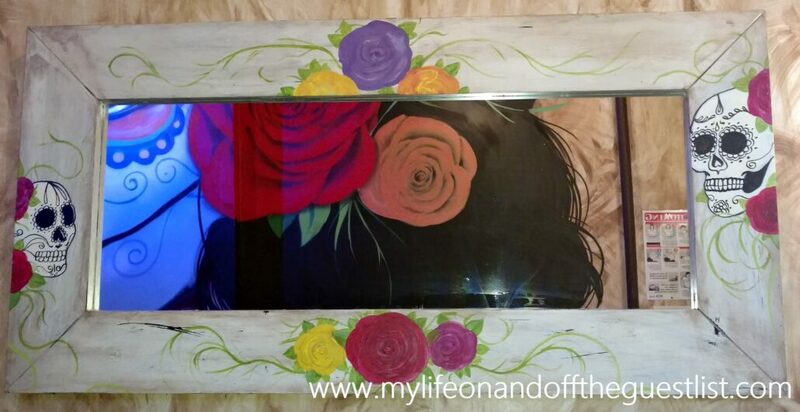 trust us, your Valentine’s Day date will be highly impressed. For those of you who think there’s nothing going on at Yankee Stadium during the off-season, you’ll be happy to hear how very wrong you are. 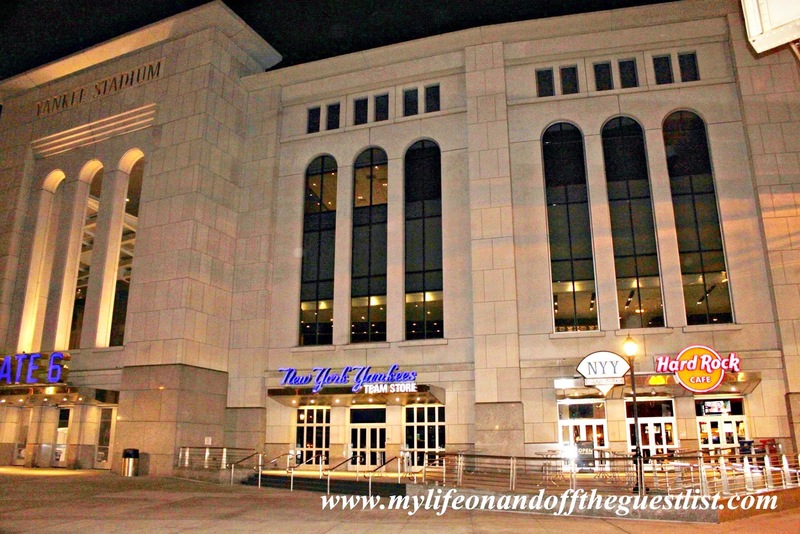 There’s much more to Yankee Stadium than just attending a game. How about your own private tour of the famed stadium, followed by a delicious meal at an affordable price? 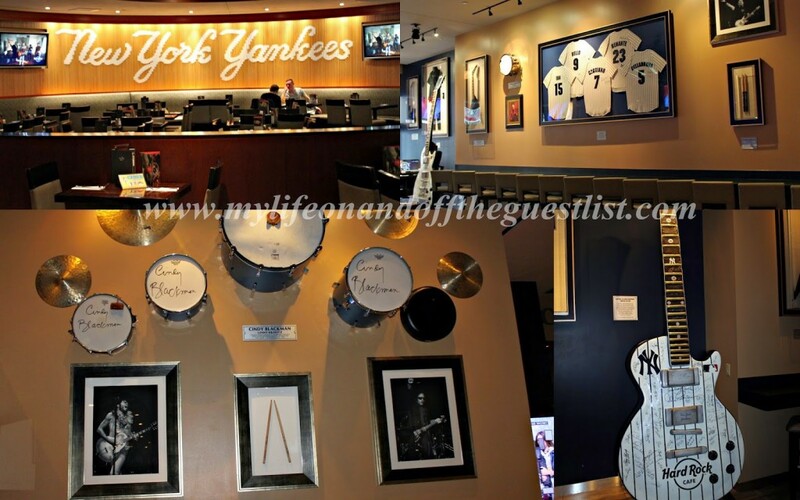 The Hard Rock Cafe, conveniently located inside Yankee Stadium teams up with the famed ballpark to bring you five amazing Yankee Stadium tour options – Classic Individual Tour, Classic Group Tour, Gold Pregame Tour, Platinum Pregame Tour, and Party City Birthday Bash Tour. Adding a stadium tour with and lunch/dinner at the Hard Rock Cafe makes the perfect holiday, birthday, or anniversary gift for the baseball fanatic in your life. what’s even more amazing, proceeds benefit the New York Yankees Foundation, so while you’re enjoying this wonderful experience, you’re also doing good. 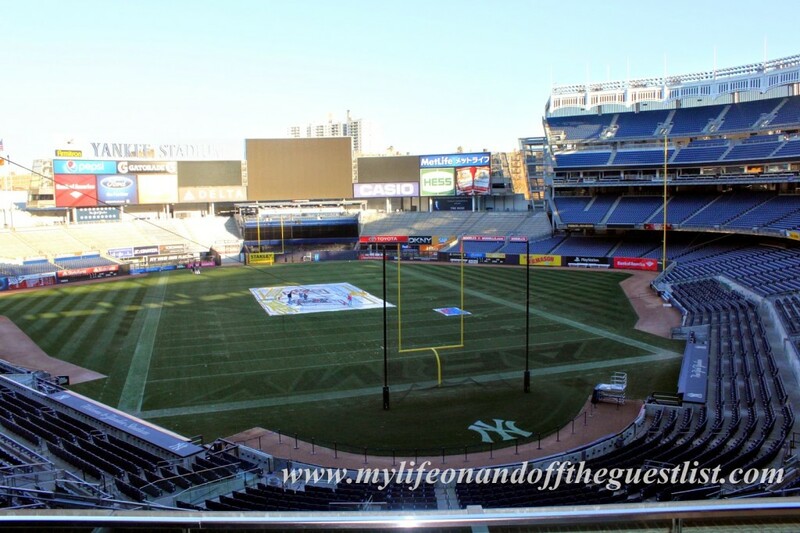 We had the honor of experiencing one of the Yankee Stadium tours and even though we’re not diehard baseball fans, the experience was such an amazing one, we want to experience it again. We imagine diehard baseball fans will describe it as magical, especially being on the field. 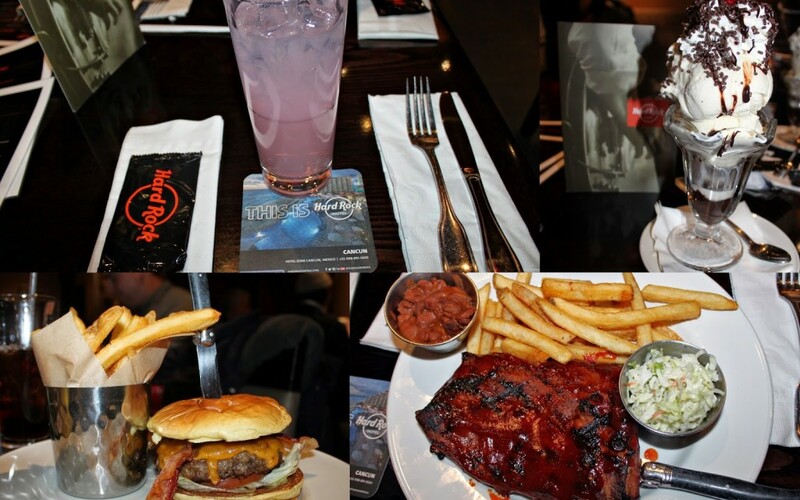 End your tour with a great lunch or dinner at the Hard Rock Cafe Yankee Stadium with one of their two prix-fixe menus – Hard Rock Cafe Voucher #1 – $39.00 or Hard Rock Café Voucher #2 – $46.00. 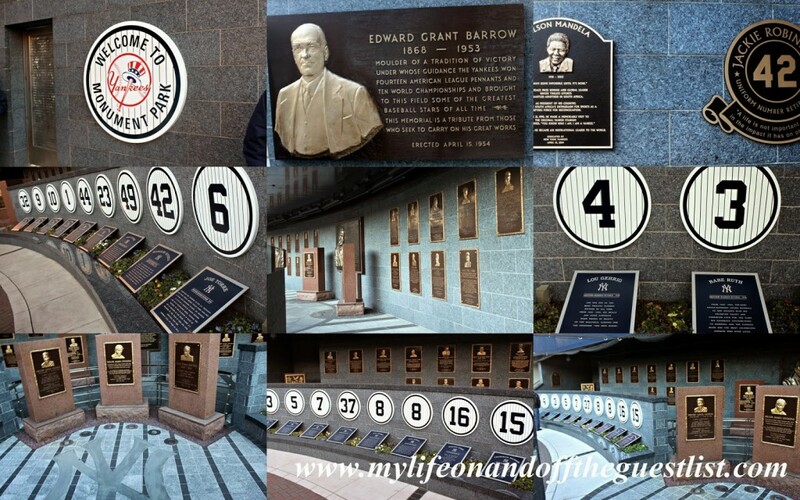 Classic Individual Tour – this tour may be purchased for 14 people or less and begins every 20 minutes primarily from 12 p.m. to 1:40 p.m. You can get your tour tickets online for only $20.00, if you purchase at the Yankee Stadium Ticket Windows: Adults: $25. Children (14 years and younger): $23, Senior Citizens (60 years and older): $23, Children 3 and younger are free. Classic Group Tour – need to entertain a group of 15-35 people or maybe your fantasy baseball league is looking for a fun night out? The Classic Group Tour is perfect for you. The Classic Group Tours are booked based on availability from 9 a.m.-11:40 a.m. and 2 p.m.-4 p.m. daily and must be reserved in advance. Cost per person is as follows: Adults: $18.00, Children (14 and younger)/Seniors (60 and older): $16.00, and up to 4 children younger than 4 are Free. Pregame Tour – already going to the game and want to add a unique experience to enhance your ballpark fun? If you already have a game ticket, try a Pregame Tour. 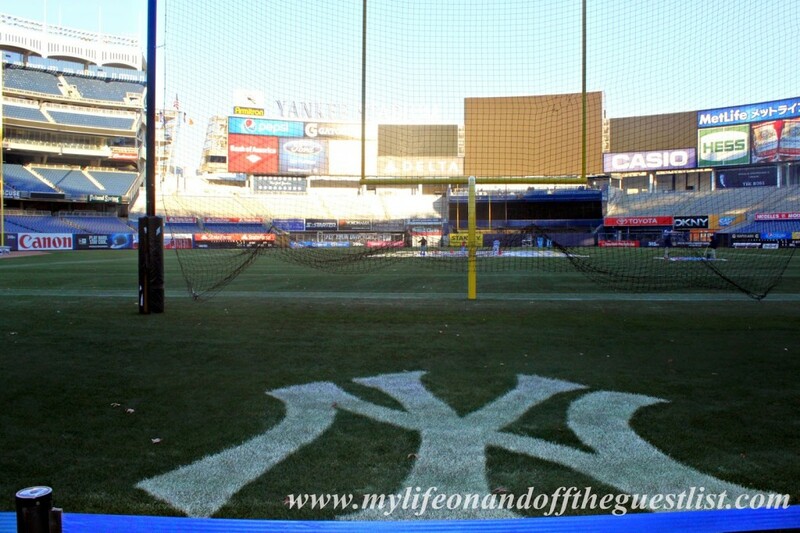 The Gold Pregame Tour costs $35.00 and gets you access to the legendary Monument Park before the gates to the Stadium open up to the public. The Platinum Pregame Tour costs $40.00 and allows you visits to the SAP Suite Level, Monument Park and the New York Yankees Museum Presented by Bank of America (when available). The tour is for a maximum of 10 guests and begins at Gate 2. For smaller groups, birthday bashes can be celebrated on public tours for $30.00 per person. 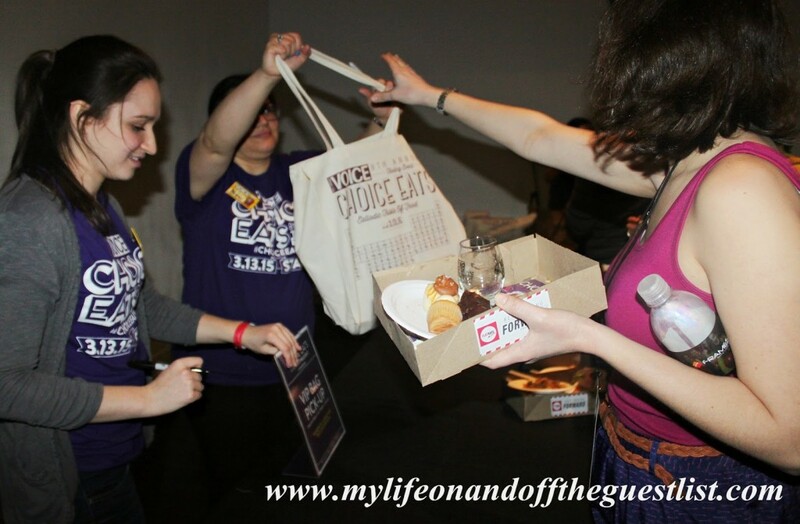 Each guest receives a New Era Yankees baseball cap and each child receives a goodie bag. 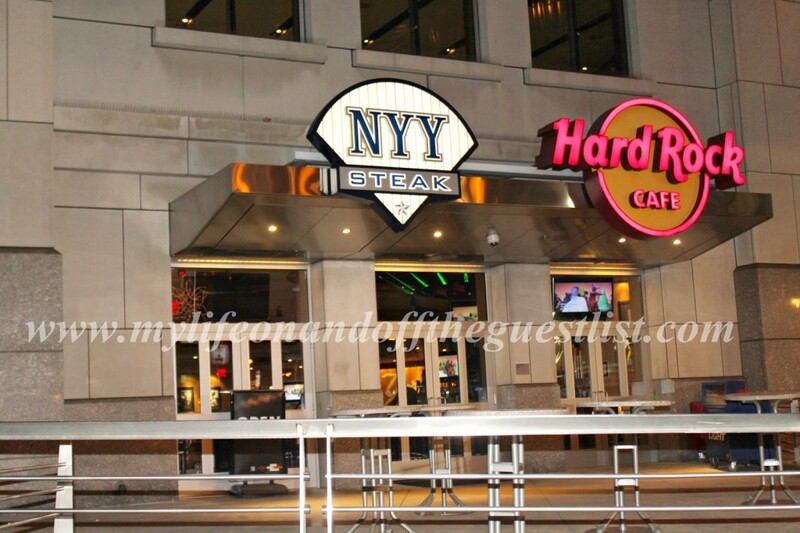 Located at Gate 6 on the corner of 161st Street and River Avenue, the Hard Rock Cafe Yankee Stadium is open year-round to ticket holders and non-ticket holders. 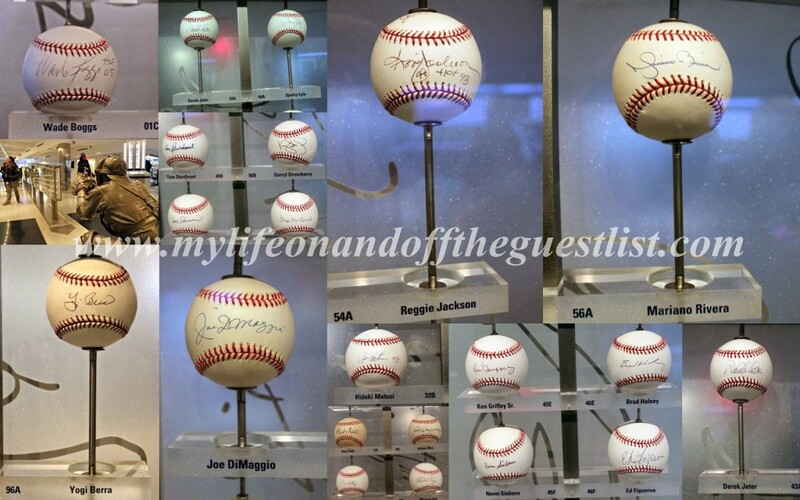 It features a world-famous collection of Hard Rock memorabilia with an emphasis on New York-area musicians and artists, as well as Yankees-related pieces. 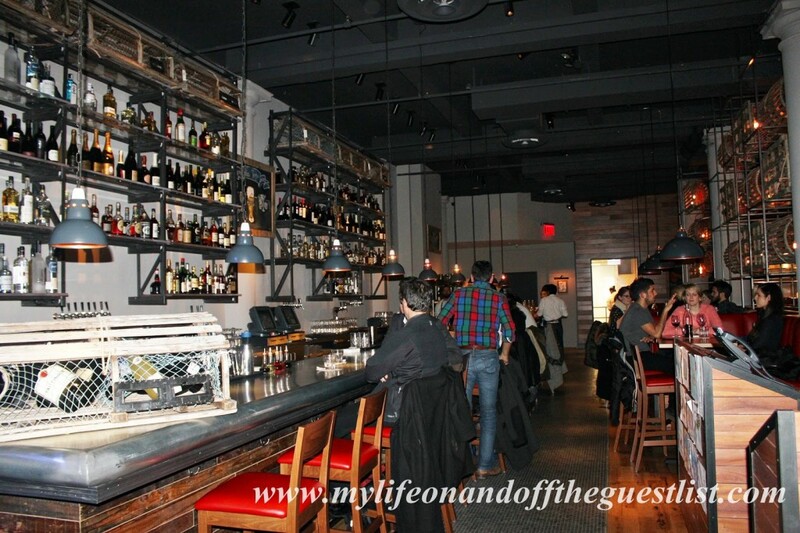 The restaurant seats 165 people, the bar seats approximately 32 people, and is a great place to relax after your tour. Our meal was amazing. 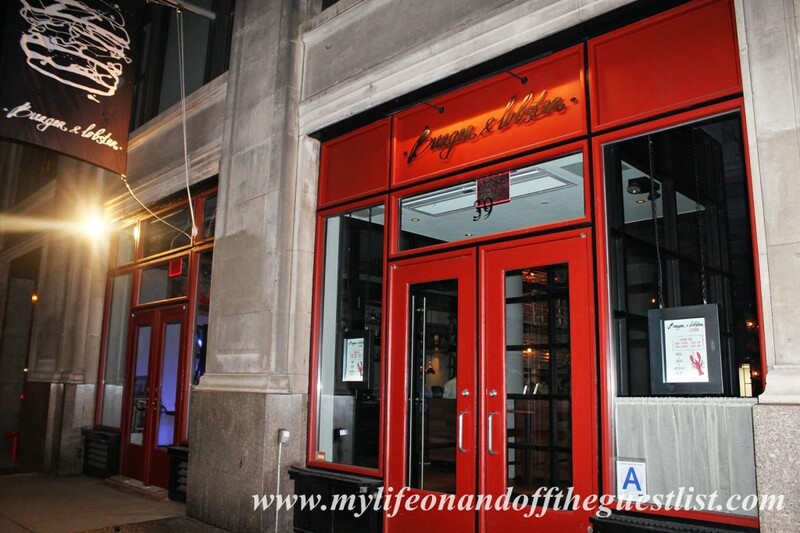 The prix-fixe meal comes with an entree, drinks, and dessert, a filling meal to sate even the most insatiable appetites. We decided to try the Half-Rack of Hickory Smoked Ribs and Original Legendary Burger with a colossal Ice Cream Sundae for dessert, needless to say, we were gleefully stuffed. Even today, several days after our tour, we’re still on a high from the experience. We’re still sharing stories and showing off our photos to friends and family, so we know any baseball fan will cherish this experience forever. So what are you waiting for, give them the gift they’ll really get excited about. 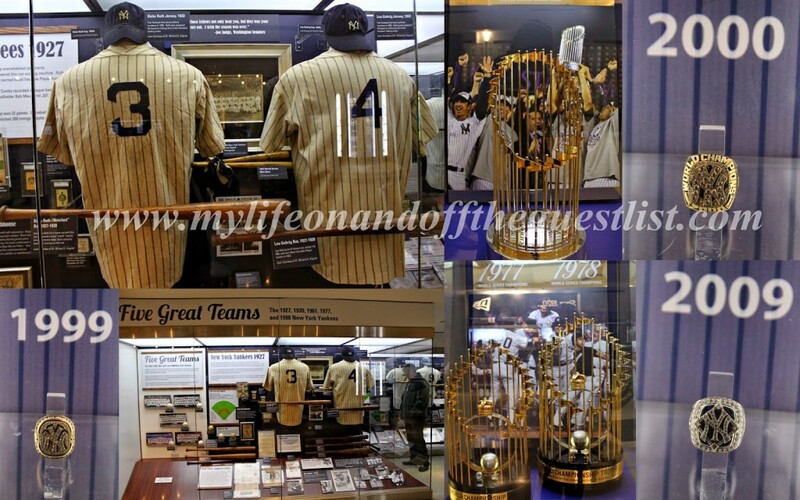 To book your tour, call the Tours Department at 646-977-TOUR (8687) or email tours@yankees.com for information.